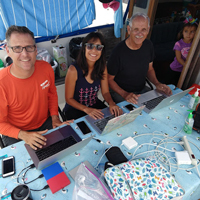 I almost decided not to write an entry using the accompanying photos, but since I am trying to “keep it real”, I knew I had to talk about how important the good WiFi at the marina has been to all of us. We have put almost all of our business accounts online, we have ordered and ordered...and ordered from Amazon Prime online, etc., etc., etc. We all know we will not have WiFi when we are on passages and readily accept that. In the two photos that look remarkably similar, you see Dito editing videos he has filmed, matching music to his videos, and writing the book he is working on in his “free” time. You see Dave writing HTML, paying bills, and managing his network of websites. You see Sarah working on her lesson plans for Zoe’s second-grade curriculum, updating the maxingout.com web site, and writing her own material for posting on the website. 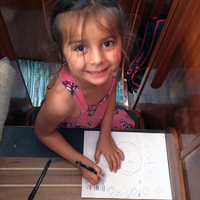 You see me writing my daily blog entries about where we are and what is happening onboard the boat, searching out word lists and phonics patterns for J,s Kinder-Grade 1 curriculum, and using instructional websites to practice Spanish. 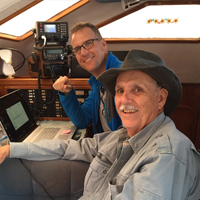 When we did our circumnavigation, we did not have computers or mobile phones at the beginning of the trip. Our kids were doing correspondence high school classes and we actually sent their lessons to the school through the mail. I think one of the things I am most looking forward to on this trip is seeing how much world cruising has changed. 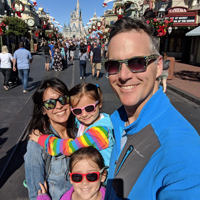 I realize how much I enjoy the new technologies I have learned to use, but I hope to use them to share our trip with anyone who would like to read my blog and “come along with us” on our family adventure. I promise not to keep saying, “I remember when...”! 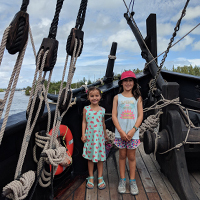 Sarah read online that replicas of Columbus’ ships, the Niña and Pinta, were coming to the main dock in Jupiter, Florida, today. The ships would be on display and tours of the main deck would be given by the crew. The crew is made up of volunteers from all over the United States and the Caribbean. The ships have no home port because they are on the move 11 months each year. A British maritime historian started building the replica of the Niña in Brazil in 1988. Using original design and construction techniques (hand adzes, axes, hand saws, and chisels), it took 32 months for 20 men to complete the project. The Niña was 65’ long and 18’ wide. She carried a crew of 24. The replica of the Pinta was built in Brazil 16 years later. The Pinta was 85’ long and 24’ wide. She carried a crew of 26. Today, the replicas of these famous ships have Diesel engines as well as sails. 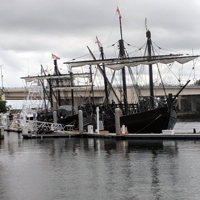 The modern-day Niña carries a crew of 7 and the modern-day Pinta carries a crew of 9. One of the most frequently asked questions turned out to be “What about the Santa Maria?” The tour guide told everyone there are no plans to make a replica of the Santa Maria, because that ship never made it back home to Spain. History records that Christopher Columbus was dissatisfied with the Santa Maria, because she was slow and unresponsive...thus, it was hard for her crew to keep the boat moving along with the other two ships. The guide also said that today a replica boat would be too big to enter some of the small ports on their itinerary. Sarah and the girls really enjoyed seeing the ships. 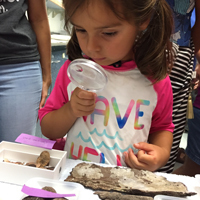 When they returned to the boat, we all started talking about what we remembered about Columbus and looked up information about the ships. 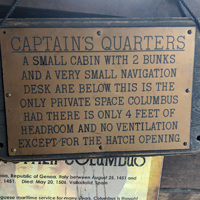 Funny how all of us could remember a song we learned in 3rd or 4th grade about “The Niña, the Pinta, the Santa Maria were sailing ship all three”...I must admit I am glad we will be sailing on Exit Only instead of one of Columbus’ ships! I woke up today and was instantly relieved because my jaw was feeling better. I am feeling bruised, but Tylenol relieves the discomfort. I am grateful the dental “event” is behind me now (except for getting the crowns, of course). The day started with breakfast, then we started boat school. We are really serious about making school a priority for the girls. We want them to see by our actions that school comes first... Monday through Friday...unless there is a very good reason to change the schedule. We try to start at 0900 (9:00 a.m.) and go until 1100 (11:00 a.m.). We had not done school on Monday and Tuesday this week, because we were very busy doing the last minute jobs getting ready to leave. Then Wednesday turned into “dentist day”, so we were unable to do school that day. 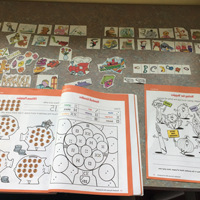 Both Z and J like to do schoolwork, and they were happy to get back to it yesterday and today. Another sign that we are getting ready to leave is most of the big jobs are done, so we can put the tools away and clean up the cockpit. We prefer eating lunch outside at the cockpit table. The other day, I tried to take a selfie with the table in the background. I decided a photo of the table itself tells the story. The table seats 8-10 people. 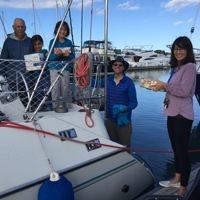 In fact, the people we met while living at the motel (they were working on their sailboat in the boatyard), arrived at A dock on their boat today. We invited the crew of 3 to join us for lunch in our cockpit, so we could catch up on their news. 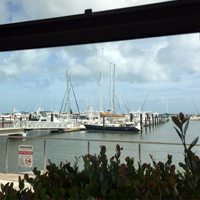 The last photo shows the marina a couple of days ago when the 30 knot north/northeast wind was blowing. The whitecaps kept rolling in. 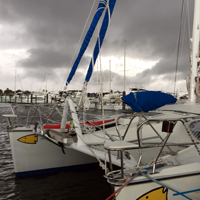 There was a gale warning posted for the central east coast of Florida. 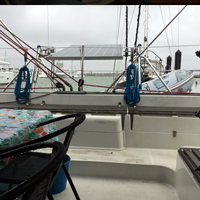 One of the other yachties at the dock told us he heard the radio reporting 17-foot high waves outside the barrier island (the marina is inside the barrier island). We woke up this morning to fog hanging heavily all around us. 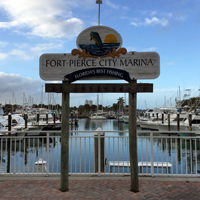 We could not see the bridge over the Inter-Coastal Waterway that is close to the marina. Standing in the middle of A dock, looking to the end of the dock, it reminded me of historic times when ships moved out of sight and people back on land thought they had fallen off the edge of the earth. The thirty knot north wind piped up today, too. Always makes getting on and off the boat a challenge. Believe me, we are exceptionally careful doing that! Sarah and I arrived at the dentist’s office at 1145 (11:45 a.m.). I was called back to an exam room at 1210 (12:10 a.m.). Five minutes later they started preparing my mouth for dental work. I will skip to the end and say that I got up to leave at 1515 (3:15 p.m.)..The experience was as good as anything like that could be, but I was sure glad when it was over. The office gave me an appointment for 8 April. I am disappointed we have to wait so long, but that seems to be an average wait for crowns. It is what it is. I am glad I was able to see a dentist and get help so quickly. I am also glad this happened here in Florida, instead of somewhere in the Bahamas! 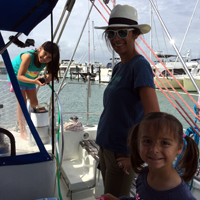 Back on the boat, Baba was helping Dito entertain the girls. 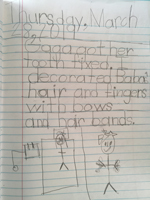 The page from J’s daily journal tells the story. The photo of Baba tells how much fun Z and J had with Baba! 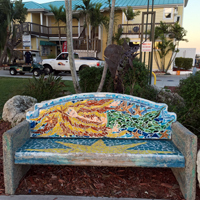 We have been in Ft. Pierce long enough to know a lot about the area, but we did not know about dentists. We looked up local dentists on Google and picked one. They opened at 0830 (8:30 a.m.), so we called and asked for an appointment for me. I was told to come in at 1145 (11:45 a.m.). Sarah (the designated driver of the rental car), Dave, and I went to the dentist. I was evaluated and the dentist said I needed a crown on the broken upper tooth...and by the way, the lower tooth directly below the broken tooth had a very old filling that looked unstable. Yes, both teeth needed attention. They told me to come back at 1200 (noon) tomorrow. In the meantime, Sarah made appointments for herself, Dito, Z, and J to have their teeth cleaned and checked. Dave also made an appointment for a cleaning for himself! All six of us had appointments! Dave, Dito, Z, and J had afternoon appointments today. Sarah will have her appointment when she drives me to my appointment tomorrow! 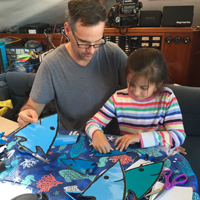 Later in the afternoon, Dito got in the dinghy with the fish cut-outs and a helper, and started to apply the fish. The were several observers watching each move closely. There...all of the fish are in place. We are very happy with the look of the graphics and like the way the fish show up well across the water. A lot of time and effort went into these graphics, but it was worth the effort! This day started out with a continuation of the past few days...getting ready to leave. Sarah, Z, J, and I went to Aldi (grocery store) to get fresh fruits and vegetables plus the supplies that go in the frig. This list was very specific...and short. 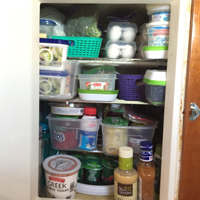 There is just not that much empty room in the frig. All of us like cheese! We cook with it, make sandwiches with it, and snack on it. Cheese was given some prime real estate in the frig! We provisioned to leave for the first time in July 2018. By now, some of the spices we bought at that time are no longer fresh and colorful. We pulled out our basket of spices from the pantry and went through each bottle. Several needed to be replaced. You can see Sarah and the girls working on that project. 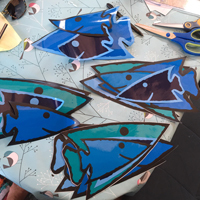 In the next photo, Z did a great job cutting out the last of the fish shapes from special outdoor vinyl material. We designed our own bow graphic. It started with a big yellow fish on both sides of both bows. We all liked the big fish, but the idea soon expanded. We have 6 crew members. What would 6 fish (2 large, 2 medium, and 2 small) look like...hmmmmm. We ordered more vinyl and more fish appeared! J had a job, too. Sarah and I went through all the school/office supplies once more. I gave all of the pens and a piece of white paper to J and asked her to check each pen by “making a line” on the paper. She sat down and very seriously started drawing a sun with several rays sticking out of it with each pen. I told her the suns were nice, but one little line would be enough! First thing every morning, we are all wondering what the grib files look like! Here is Dito checking the gribs out...grib files are continuously updated around the clock. So far, so good...the good weather is holding, so we can continue to do outdoor boat jobs. There is Dave, down under the cockpit table, putting duct tape around the base of the two pedestals. He is going to seal and protect the wood with layers of epoxy and white paint. 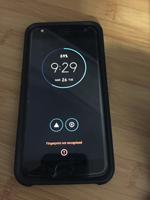 If we really do leave, it is time to face putting our phones “to sleep”. Our goal was to keep our phone numbers. Dave and I have two different phone carriers. We called them both...long story short, it was more expensive than we expected to keep our phone numbers and we still had no phone service. Another long story short, we decided to look into Google Fi. We went to the first Best Buy and found two phones and one SIM card. The we drove an hour to a second Best Buy and found the second SIM card. 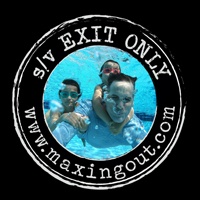 Now, all 4 adults on sv/Exit Only have phones using the Google Fi phone system. The main feature I like is unlimited texting from 200 countries. We did not have boat school today, because there are so many little things we are trying to get done “just in case” we leave this week. The kids pitched right in and helped, too! 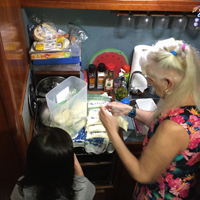 We always like to leave on a cruise well-prepared in the galley, the salon, the cabins, and we try to do a really good clean-up. Today was the day for shaking the rugs, then laying the rugs out on deck in the sun. J was in charge of helping her mom bring the rugs from the cabins and the passageways out to the cockpit. Once the rugs were out, Z came along with the sweeper. The attachments that came with the sweeper are super useful for getting into all the nooks and crannies on a boat. 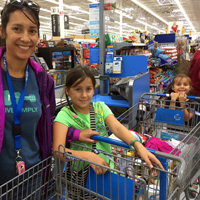 In the afternoon, Sarah, Z, J, and I went to Walmart to get the last items left on our dry goods list. We have been shopping little by little from the dry goods list over the past few days, so the list we had today was fairly short. We are trying to leave with every possible food storage area full. With six people to feed, we will go through the provisions at a steady rate. 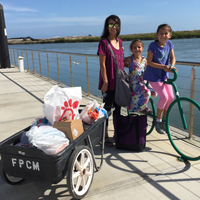 The main reason to fill our storage is the fact that although food is available everywhere, it is often significantly more expensive in many of the tourist areas closer to the States. Once we get down island in the Bahamas, there are fewer supplies available because there are fewer people living and traveling there. Having our own supplies makes us self-sufficient. Dito, Z, and J helped move the grocery bags from the car out to the boat. Today was “fill up the fuel tanks day”. 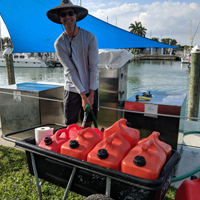 At the marina, we can actually drive the boat over to the fuel dock and fill up with diesel fuel, or...we can use 5-gallon jerry jugs. We chose to use jerry jugs. 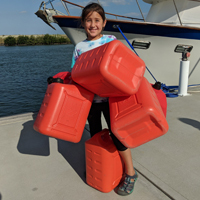 Z helped carry the empty jerry jugs from the boat to the fuel dock. Dito used the fuel pump to put 5 gallons of diesel fuel into each jug. Sarah helped Dito put the fuel jugs into a marina cart. 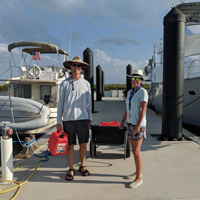 Sarah and Dito were able to carry 8 jerry jugs in the cart (a gallon weighs 8.3 pounds, so...a 5 gallon jug weighs 41.5 pounds) and Dito carried another jug in his free hand on the way out to the boat. Once the two fuel tanks are full, there is another run to the fuel dock to fill the jerry jugs again. When we leave the dock, we will have the full jerry jugs lashed on deck. We have been looking at the grib files and watching the weather forecast. I have mentioned before that we consider forecasts for 1-3 days ahead pretty reliable. Any forecast longer than that, Dave calls “fantasy weather”. Well, this next week is looking pretty exciting...30 knot gale-force winds coming in mid-week. After that, there may be a possible “weather window” opening for good sailing south. 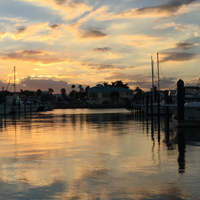 We will be sailing south down toward the Ft. Lauderdale area, before we turn east to the Bahamas. We need to do this to avoid the extremely shallow Bahama Banks that are located almost straight east of Ft. Pierce. 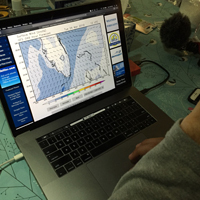 We are in “wait-and-see” mode, but agreed to put our efforts toward being ready to leave by the end of the week if the “weather window” is good. This is how leaving always is...hurry up and wait! We all know in the course of our lives, medical attention is sometimes needed...medical emergencies happen. Those of you who have been following my blog know we have had medical problems arise and delay our departure to the Bahamas two times now. We have had good medical and dental attention in the States when we needed it. 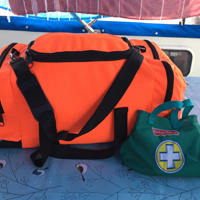 We also want to be prepared if and when medical emergencies happen when we are cruising. We are fortunate that our crew includes both an M.D. and a P.A. Sarah is a P.A and has extensive experience working in busy hospital E.Rs. 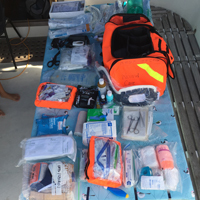 She used her own knowledge and experiences, then consulted with several medical coworkers to prepare a list of what should be included in the medical kit for our boat. 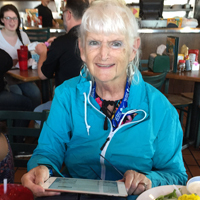 She has focused mainly on the care of urgent medical conditions when medical care is not available. We also have a good supply of non-emergent medications that might not be readily available. We do have a plentiful supply of bandaids...with both My Little Pony designs and Star Wars designs. Guess who asked for those! 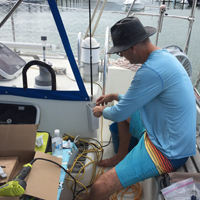 Installation...Yesterday was all about doing the interior antenna work in the navigation station area of the boat, then bringing the antenna wire up through the deck. 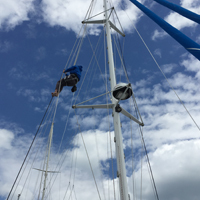 Today was about taking the long outside piece of the antenna wire up to the top of the mast. It is important to have the antenna reach as high as possible...the higher the antenna, the better the propagation (incoming and outgoing radio traffic). Of course, this means a trip up the mast! You can see the team assembled on the deck. Dito has put on a bosun’s harness for safety. 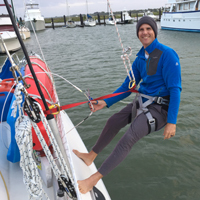 He is also wearing a safety belt from this harness that goes around the running rigging (a wire from the deck to the top of the mast). 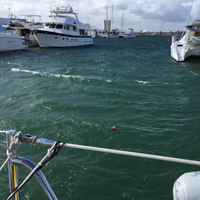 Near-by, there is a rigger’s block and tackle attached to a halyard (a lifting line running from the deck to the top of the mast). 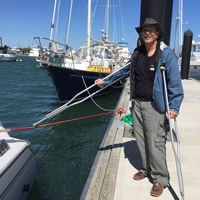 Dave is standing by the winch located on the base of the mast. The line on that winch is attached to Dito’s harness. Z is standing back from the mast pulling on the line coming from the winch (this is called “tailing”) to keep it from piling up by the mast. There was more work to do on setting up the radio antenna today. In photo #1, Dave was using self-amalgamating (sticks to itself) tape to put the top end of the wire antenna around a nylon thimble (shaped like a raindrop). 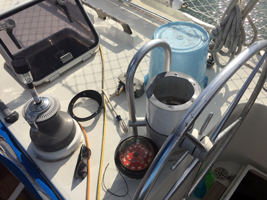 They will tie a line through this thimble to pull the wire antenna up to the top of the mast. Photo #2 shows Dito in a harness hiking out on the side of the starboard hull. 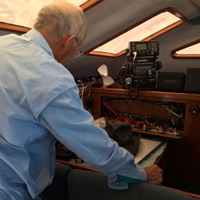 He is there connecting the antenna wire coming from the antenna tuner located near the radios at the navigation station inside of the boat. The wire comes up through a waterproof fitting in the deck. Dito is connecting the end of this line to the antenna wire that goes up the mast. How does Dito know how to do all of these things? Photo #3 shows y’all the on-site experts who were just outside the view of the camera! 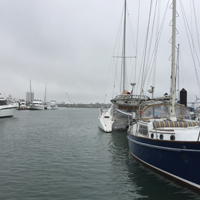 The day was overcast and the north wind was blowing a steady 20-25 knots. That is why everyone is dressed for “brisk” weather. A job well done today, but there is a little more work to do tomorrow before this project can be considered “done”! Dito is already back from Kentucky! 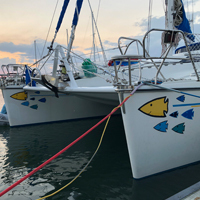 He had a late evening flight, so he and Sarah returned to the boat around 0130 (1:30 a.m.) this morning after a 2-hour drive from the airport to the boat. We did try to be quiet and let them sleep in a little longer this morning. 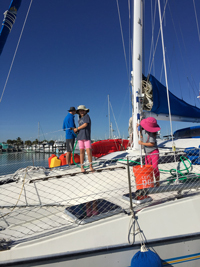 After “boat school” in the morning, the boat jobs continued. Dito updated the labels on the electronic panel. I chose some neon colors for a “rainbow effect”. Dito managed to color code the salon switches, the outside switches, the instrument switches, etc. Then, Dave and Dito turned to the main challenge of the day...to get get the SailMail computer program going. SailMail is a program we purchased. 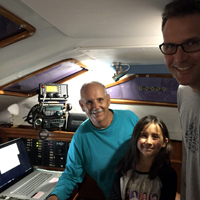 It allows us to use ham radio (Dave is an extra class ham radio operator.) to download grib files. Grib files are pictures of wind and weather maps that tell us what is going on at the moment and forecasting what will be happening in the next few days. We can get information for any area of the world we are interested in...where we are located or where we are going. We trust the grib files to accurately tell us about the weather for the day and maybe 1-2 more days ahead. This is another BIG clue that we are getting ready to head for the Bahamas...but (most importantly! ), we will not leave until the wind and seas and the location of the Gulf Stream are favorable! Some of our friends are traveling overseas soon. I was telling them about how happy I am with the small charger I have for my iPhone and my minipad. 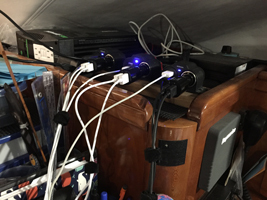 Then, another friend asked me how we were keeping up with charging our electronics while sailing. I thought I would address that issue. 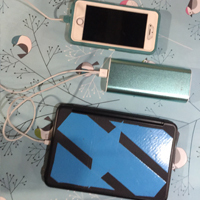 Our daughter had told me about how she uses small powerful chargers whenever and wherever she needed to charge her phone. At the time, I did not feel I needed one. 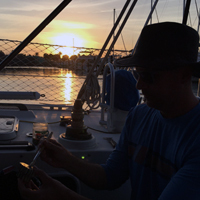 Now, that we are living aboard the boat, I see a real advantage to charging a charger, then carrying it with my phone wherever I go. I can plug my phone or minipad into the charger anytime and anywhere. The first photo shows both my phone and my minipad being charged by my charger. 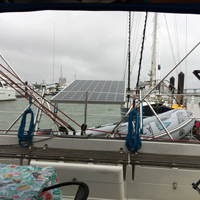 The other photos show the 12-volt inverter Dave and Dito installed on the boat. 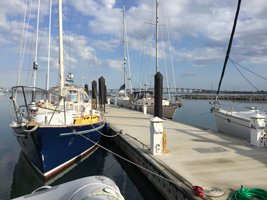 We are located at a dock with electricity available to us right now, but once we leave, we rarely go into marinas. We usually anchor out, so we have to be self-sufficient. Even though our phones will be “sleeping” (meaning we cannot make or accept phone calls, texts, etc., but we do keep our phone number), we will still be using our phones almost daily to take photos and play music. That is why we need to keep them fully charged. I also have a fold-up solar charger that is my “backup”. I think back to how we did not have mobile phones and did have only a very basic computer (nothing like today!) when we left on our circumnavigation long ago! Big changes...we certainly did not need a “charging center” back then! Another busy day! We all have the feeling that we really are getting ready to leave...that this time we really will move away from the dock and head for the Bahamas. Still hard to believe we have already "been there and done that" ...in July 2018 and again in January 2019. I will admit we are not talking about it out loud much this time. We all are into the sorting through the lists, the last minute jobs, doing what needs to be done, etc. We are focused on the future...not the past! 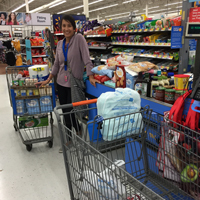 Another BIG clue that we are getting closer to leaving, is provisioning for 6-8 weeks...this was a big shopping trip to purchase dry goods and packaged goods. Our final shopping trip will be for fresh foods and foods that need refrigeration. Y'all can see from the photos that we had lots of help! The third photo is Z in the cockpit bagging the cans of pop for storage. This is a very important job! 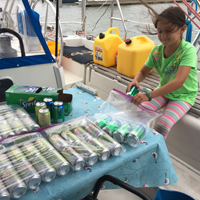 When we left on our circumnavigation, we filled a locker (storage area) with loose, stacked pop cans. 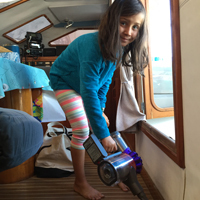 Our inexperience resulted in one of the biggest messes we ever had to clean up on the boat. Sailing day after day, the motion of the boat caused the aluminum cans to constantly rub against each other. Pinhole leaks appeared in many of the cans (we were not aware this was happening). When we did discover many of the cans had leaked into the locker, we also discovered the multicolored mold growing there. The smell was awful! SO...after cleaning out the locker, we immediately bought plastic trash holders and cut them to fit in the locker. We packed all of the cans in ziplock bags, then put the bags in the plastic containers. 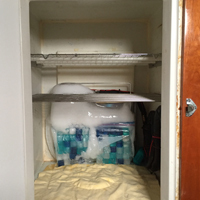 This system kept us from having to deal with the curse of the "rainbow mold" ever again! This day started earlier than usual, because Dito got up around 0600 (6;00 a.m.) to get ready to leave by 0630 (6:30 a.m.) to drive their van back up to Lexington, Kentucky, to put it in storage. This is the first BIG clue that we are getting close to going offshore. Dito will be flying back to Florida on Monday evening. I will be discussing more about getting ready to leave in the next couple of days. Meanwhile, in Ft. Pierce, Sarah and I needed to pick up our reserved rental car from Enterprise. Turns out they did not have a driver to pick us up today. One of our yachtie friends offered to give us a ride. After a fairly long wait, it was our turn at the counter. After another long wait, we got a car. About two hours later, Enterprise called and asked how our renting experience had gone. We told them it was O.K., but had lasted a little longer than we expected. They gave us money off of our rental for waiting! You can see what today looks like...foggy with drizzly rain...light wind from the North...cool, not cold. 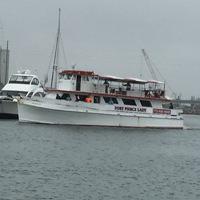 I was surprised when I saw several people aboard the mv/Ft.Pierce Lady (mv = motor vessel...sv = sailing vessel) when it returned to the marina this afternoon. It is a boat that takes people out daily for drift fishing. I wonder how the folks who went out in this sloppy weather enjoyed their fishing today. When you live in the desert, you do not think about rain very often. Living in the tropics, rain happens...often...and life goes on...no big deal. The weather in the afternoon made it a good time to get cozy with a warm blanket . 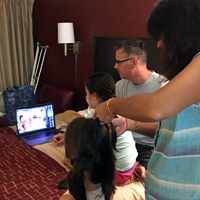 The junior members of our crew are always mesmerized when they are allowed to watch videos. Just making the best of a dreary day! This was one eventful day. One thing sort of led to another...first things first, we did school after Sarah made Zoe’s favorite breakfast...fried egg and bacon on toast. Next we had a birthday party! Zoe is going to be 8 years old on 25 March. 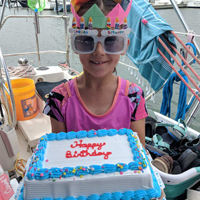 Sarah decided to celebrate Zoe’s birthday today, because their car is still here for getting the requested ice cream birthday cake (Dito is leaving tomorrow morning to drive the car up to Kentucky to put it in storage). 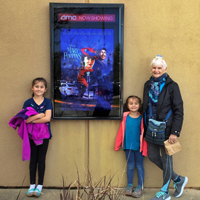 The movie Zoe wanted to see for her birthday is showing now, too. Let the celebrating begin! After school, we straightened up the boat. 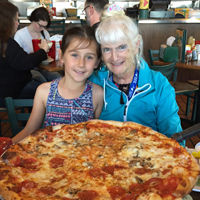 Next, we had a pizza birthday lunch. 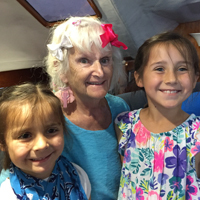 Two friends from another boat joined us and helped eat the birthday cake. Presents suddenly appeared...then, a quick clean-up and it was time to leave for the movie. Dave and I opted out of the movie and stayed on the boat. In the meantime, Dito and Sarah got a text from Kentucky friends who are vacationing in Florida. They wanted to come by today and see them and the boat. So, after the movie, they met their friends at the marina building and all of them came out to the boat. 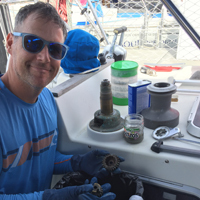 For a long time, I have been using this blog to tell about all of the boat jobs we are doing...because that is what we really are doing. 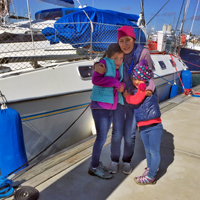 I am trying to use my blog to tell our story...three generations settling into a 39’ catamaran...getting ready for an ocean adventure. I want my entries to be “interesting”, but I am also committed to “telling it like it is”...like it really is. I decided to take a break today from talking about more boat jobs and tell/show y’all what happens when Baba (Dave) goes shopping. The other day, Dave and Dito were getting supplies for their projects at Ace Hardware and Home Depot, etc. They happened to go to Walmart for something. They came out of the store with a 6’6” kayak for J and Z! It weighs about 20 pounds and is very buoyant. We already have a 10’ kayak from our previous trip, so now we have one large kayak and one small kayak. 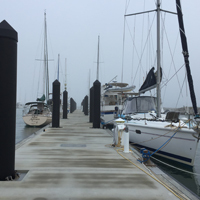 Both of the kayaks will set in a chock on deck and be lashed to the stanchions (these are 24” stainless steel posts located around the edge of the 2 hulls). Stanchions support life lines (safety lines) and safety netting. Counting our dinghy on the davits, it looks like we have our own fleet of boats! Sarah and I have been going through all of the school supplies to make sure we have what we need for the next school year. 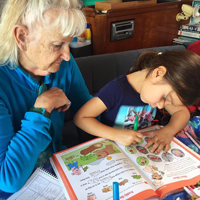 She has ordered textbooks and workbooks to use next September. We are planning to complete our current school year 1 June. In June, July, and August we plan to have “short school” (my name for it) doing quick review work of what we have done this school year. We also pulled out all the flags today. I have mentioned before that we are required to fly the flag of our country of registry (Cayman Islands) and the flag of the country we are visiting. We keep the flags rolled up and organized alphabetically in large ziplock bags. We went through and checked that the flags were in good shape (many were flown on our circumnavigation and show some wear) and stored in the correct bag. Z was in charge of putting them in the bags. 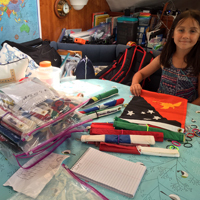 She counted 87 flags in all (countries, plus others like “diver in the water” flag and a “Q flag” (a yellow flag you fly as your enter a new country to show you are waiting for customs, immigration, and health officers to allow you to officially enter their country). Dave and Dito decided to tear down the two large winches while they are waiting for the wet places (caused by their efforts to find leaks) to dry out. Tearing down the winches means taking the winch apart and removing the gears, which are then washed in mineral spirits. After the cleaning is done, the gears are greased and reassembled. Both winches are ready to go now...just like new! The search for the leak continues. The most obvious possible places for a leak have been checked and either silicone or 5200 (caulking compound) has been applied. Now, Dave and Dito have gone to the next level of possibilities that are more complex to check and fix . They are focused today on the genoa track again. This time they have removed part of the track, taped off the area with yellow tape, and put in silicone everywhere it would go. They also caulked the area in the large cockpit drain area. 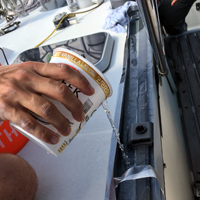 There are cracks in the gel coat (due to the age of the boat and drying out for years in the Florida sun while in storage) that could possibly be letting water seep through. They have made progress in stopping the big leaks, but still are not satisfied that they have found the source of the smaller leaks. The search for these leaks has taken a lot more time than we expected. The rest of us spent the day doing inside boat jobs like getting things better organized and stowed...ready for going offshore. Fortunately, the other boat jobs that remain to be done are not big jobs. Having said that, I will add that each of these jobs always seems to take longer to do than we thought it would! There was a lot going on today, but not too much of it was new or different. As you can see from the photos, we are STILL looking for another leak. 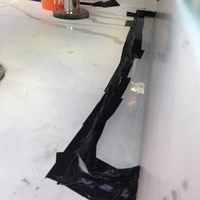 They have found and stopped the bigger leaks, but there is still a small amount of water working its way through the boat.The first photo shows the genoa track with the top piece removed. The line (rope) from the genoa comes from the foresail to a movable car on this track, then back to the winch. The angle of the line from the sail is held in one place by the car. They thought the screws holding the track might be the source of a leak, so Dito dramatically poured a controlled "rainstorm" into the track. 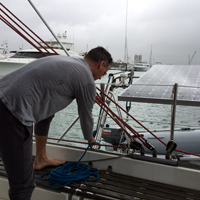 Dave has a rag and is trying to keep the water away from the porthole below the track. I am watching all this and thinking how grateful I am that this is not one of my jobs! The whole crew is back on EXIT ONLY tonight! David and Sarah brought some of the "stuff" back to the boat from the motel last night. 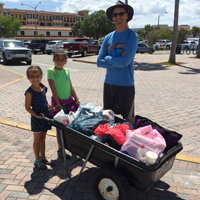 This morning we packed up the rest of the "stuff", loaded the car, and left the motel. It was Saturday Market Day, so we had to wait a couple of hours before we could get a parking place close to the marina. What to do? 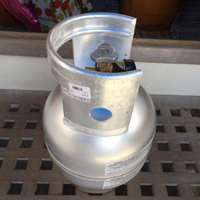 We went to buy a propane tank! 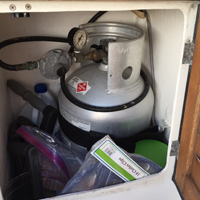 We carry a 30-pound tank already, so when that tank is empty, the new 10-pound tank will keep the stove/oven going until we can find a place to refill the larger tank. Dito and Dave crossed more items off the boat jobs list. 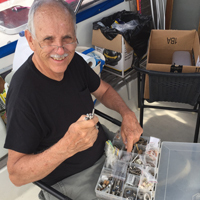 In the photos, Dave is sorting through a collection of screws to find the right size for Dito to use to mount the new winch handle holder. Under way, we keep a handle handy on each side of the cockpit near both winches. 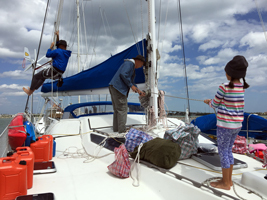 The lines (ropes) from the foresail (front sail) come back to wrap around the winch so we can haul in (tighten) the sail. 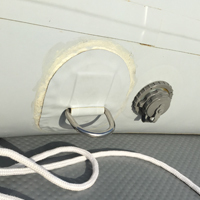 The winch handle is inserted into the top of the winch to give leverage and make it easier to haul in our 500 square foot genoa (the foresail). More jobs to be done, but we are getting there! This was a memorable day! Dave made it onto the boat for the first time in two months! Dito took Dave to his physical therapy appointment. 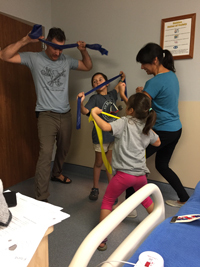 This physical therapy session turned out better than we hoped for. 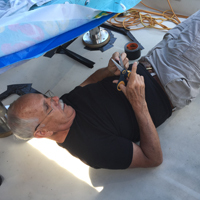 Dave showed the therapist photos of the boat and discussed the "up and down" challenges from getting on and off the boat to maneuvering from one hull to the other. She took him to a set of stairs and started showing him how to approach and board the boat, etc. She showed him exercises for strengthening his leg muscles as well as smoothing out his gait. She thought he was doing well today. Dave is going to do five more physical therapy sessions next week. We are encouraged! We are actually making lists of what we want/need to do before we leave for the Bahamas! Stay tuned! Now we have a new situation! We can hardly keep Dave from walking! After sitting in a wheelchair for almost eight weeks, the doctor said he could do whatever he was comfortable doing. Well... Dave started walking! 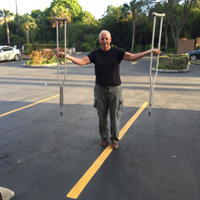 He was carrying his crutches in case he needed them, and walking around part of the motel parking lot. He did 10 rounds, then went inside our room to rest for an hour. He repeated this routine several times. I was in the room in the afternoon and the door was open. The motel owner was walking by. He knocked on the door and very kindly said, "You must tell him to slow down. He is doing too much too soon!" Dave has an appointment with physical therapy at 1400 (2:00 p.m.) today. We are looking forward to hearing their plan. The two strange looking photos show the duct tape channels Dito created to isolate areas of the cockpit floor that might be the origin(s) of the leaks he is looking for. He found one leak today and will do more testing tomorrow. Dave saw the doctor this morning and received a very good report. The doctor read Dave's x-ray and said the fracture was aligned correctly and there was definite evidence of healing. He said Dave could go to full weight bearing (or whatever he is comfortable with). 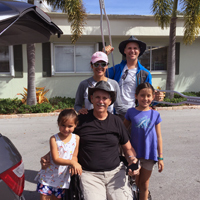 Dave was ready to get out of the wheelchair and immediately started using his crutches for "a little" support instead. He and Dito came to the marina, so we could see Dave walking on the dock and so Dave could see the boat. He did not try to board the boat today. Now that Dave is walking again, the doctor arranged for him to go to physical therapy. His first appointment is Friday at 1400 (2:00 p.m.). We will find out then what program and timeline the therapists have in mind. We are all so pleased that the past eight weeks are behind us and now we can start thinking about the Bahamas again. We celebrated by going to Vero Beach. 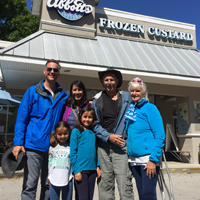 We ate lunch at a favorite Greek restaurant and enjoyed dessert at Abbott’s Custard. No, there was no discount if your name was Abbott...we asked! Leaving the motel to go to the boat this morning, I was surrounded by fog. 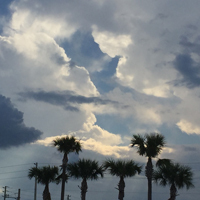 The cooler weather was starting to reach down into Florida today! The first photo was taken from A dock. 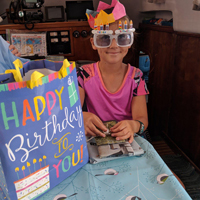 When I arrived at the boat about 0850 (8:50 a.m.), the girls were so excited and started saying, "It is your birthday, Gaga!". Having no clue about what was going on, I told them one birthday each year was enough! There was a big surprise waiting for me in a medium-sized box (decorated by Z and J). 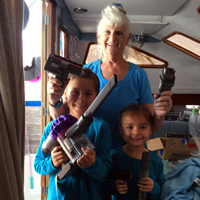 Sarah ordered a new 12-volt vacuum cleaner for the boat! It is very fancy and comes with an attachment for every cleaning challenge. 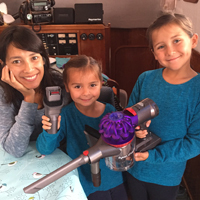 There are a lot of nooks and crannies in a boat, but this vacuum cleaner will be able to clean them all. What a nice surprise! Dave goes to the doctor tomorrow morning. We are anxious to see what happens next! When I went to the boat for school this morning, the sun was shining through the clouds, but we all know a cool down is coming in the next 24 hours. The sky seemed to be trying to demonstrate to anyone who was paying attention, that things "up there" were in transition, too. "Change" was in the air! After school finished, J brought out her substantial collection of miniature My Little Pony unicorns. Z got out her magnet tiles. Quickly, the tiles turned into stalls for all the ponies/unicorns. 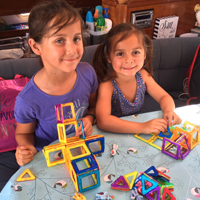 The magnets are great toys for a boat because they encourage creativity, do not get easily lost, and are stored in a small space. Sarah and the girls came over to the motel to swim after lunch. We were all out at the pool for awhile. A couple we had spoken to in passing at the pool a few days ago was there today, too. The lady spoke to Z and J, then the man spoke to them. He turned to me and said, "This girl just told me she lives on a sailboat. Is that true?" Long story short, he and his wife are here getting their sailboat ready to go cruising. We had fun talking with them. I spent the evening turning those recycled workbook page pictures I cut out long ago into flashcards. J is working hard on phonics and word families. She is reading more words everyday. 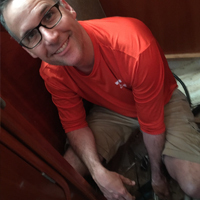 Dito is still looking for the source of the small leak that keeps taunting him with a puddle in the bilge. He and Dave are determined to stop that leak! 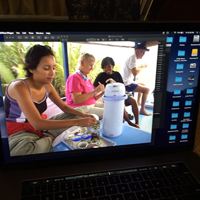 The third photo is a flashback from our circumnavigation. Dave found it in some old photo files today. 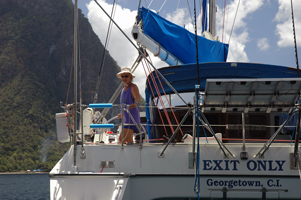 That is me on EXIT ONLY anchored off the Pitons on the island of St. Lucia in the Caribbean (2005). It is the weekend again already! Ran errands to several places in town this morning while I had the car. Dave and I had Wendy's for lunch in the motel room while the rest of the crew ate on the boat today. 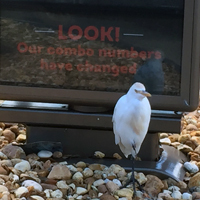 My egret friend was standing in the shade of the hamburger sign by the drive-through line. Dito is still searching for the water leaks and was at it all day. He needed Sarah's help, so after lunch I drove to the marina and picked up Z and J. I brought them back to the motel so they could go swimming. Dave and I were enjoying the sunny day out by the pool, too. We were helping Z perfect her new surface dive and J was diving down for rockets. Dave was rating their efforts by how many M&M's that dive was worth. You can see by the photo that they both did well! They also got to watch TV. 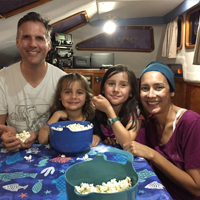 Since we do not have a TV on the boat, they really enjoyed that! They stayed for supper with us, because Dito and Sarah searched for leaks into the evening. They did find one small leak, but there seems to be another one. Better to find it now and be done with it! Dave moved into the motel two weeks ago today. 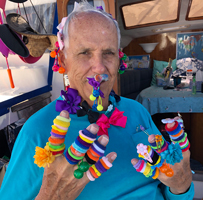 He is feeling good...he is certainly well-fed, thanks to his personal "meals on blue wagon wheels" lunch service, (we cook on the boat, pack the food up, and then, all of us eat lunch with Dave at the motel) and he does not have time to feel lonely! His hotel room has really good wifi...so...In the first photo y'all see Dave and Sarah were discussing moving articles and photos from one device to the another. In the background, Dito was editing video for posting on maxingoutforlife (Instagram and Facebook). I was working on my blog entry before I took the photo. After lunch, the girls tried using their boogie boards as kickboards in the pool. 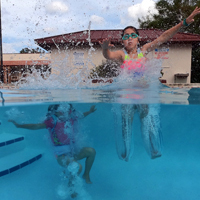 After awhile, J decided she could dive for the weighted rockets in deeper water. The weather has been warmer, so the water is a tad warmer. I supervise from poolside. The water is still not warm enough for me! I am amazed to see that today is the last day of February. When Dave fell and "cracked his acetabulum" on 13 January and was told to not bear weight on his leg for 7-8 weeks, I thought, "2 whole months?!?!?" Now, that period of time is almost over. Monday, 4 March is the beginning of week 8. Dave goes to the doctor on 6 March. 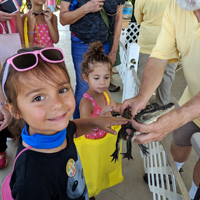 Today, the kids went to the annual Open House (literally held one day every year) at the Smithsonian Marine Reseach Center located on Hutchison Island here in Ft Pierce. The highlight for Z and J was the Touch Tank. 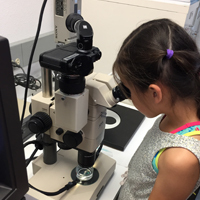 They touched a jellyfish, a sea star, and a crab...plus they liked seeing microscopes that real scientists use everyday! 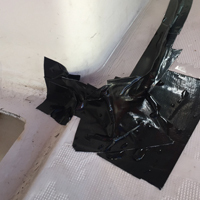 Welllllll, looks like we had a little too much joy too soon...water is still leaking into the boat...specifically, into Dito and Sarah's starboard aft (right side of boat, to the rear) cabin. It is true that much less water is coming in (even though it did rain last night), but...any leaking is too much. 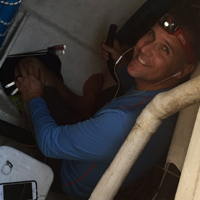 Dito and Dave have conferred using Facetime, so Dave has been able to "see" different places in the boat where they think the leak might be located. Dito has been caulking several areas they have discussed. I should tell y'all that the binnacle holding the compass is not leaking anymore. 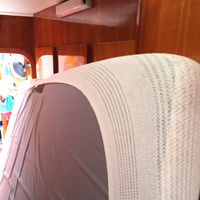 The first photo shows the bunk mattress pulled into the center of the starboard hull. Dito put it there so he could access hard-to-see areas in the cabin. Photos 2 and 3 show Dito setting up two different fans to dry out the storage areas in the cabin. We are glad we found the leak (s?) while we are still at the dock and have access to electricity. Things dry up much faster if we can use electric fans! So the search for the elusive leak continues! 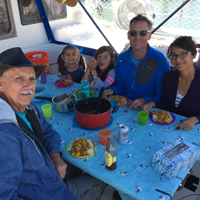 Had a routine morning with boat school, then fixing lunch on the boat, packing it up, and going to eat with Dave at the motel. After lunch, the girls got ready to swim. Dito said he had an errand to run and could not go to the pool. Sarah was finishing typing an article for the website. Baba and I went with the kids to the pool. 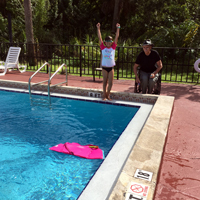 Z took the pink preserver vest to the pool so she and Baba could play the game they made up...(the "game" is similar to throwing horseshoes). 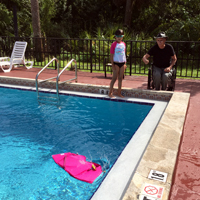 The kids also have four weighted rockets we throw into the pool and they dive in and retrieve them. Z and Baba each throw two rockets at the floating vest. They get points when a rocket lands on the vest. Then, Z dives down and retrieves the "misses". 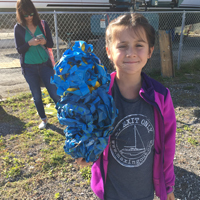 When it was J's turn to play with the rockets, I threw them in and she retrieved them...maybe 100 times ( or not!). She loves it! 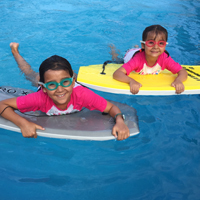 We are so happy to see both of them so comfortable in the water! The big water test has been done...the big test to see if the leak problem was truly solved. Dito was down below in the starboard aft cabin waiting to see what happened while Z was up by the binnacle with a water hose, dousing the compass cover with water. Good News! The repair job Dito did on the binnacle worked! No water leaked! Dito checked the areas that had been wet. He had dried everything out and everything stayed dry today! We are so glad we found this problem at the dock! 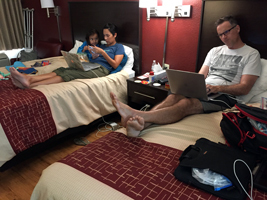 The other two photos show Sarah, Dito, and me at the motel...each of us busy on our computers. We have Wifi at the marina that is usually good. 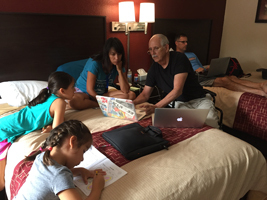 The Wifi at the motel is better, so all of us were making good use of it while we were there. Sarah was working on an article for the maxingout.com website. Dito was doing some writing for the website. I was working on getting my blog entries and photos ready to download to Sarah, so she could upload them into the website. Dito found evidence of rust on the brand-new engine. The man who installed the engines came by and inspected the engine room. He said water was leaking, but he could not discover the source. Dave and Dito have spent a long time talking on Facetime while Dito used his phone screen to point out rust spots and different wet places in the engine room. They finally traced the leaking water... from the rust on the engine...to the ceiling of the engine room...to under the mattress in Dito and Sarah's bunk...to the steering cables...to the binnacle (holds the compass so it can be seen from the starboard steering wheel)...to the compass itself. The gasket on the compass failed. The photos tell the story of using fans on all wet areas to dry them out. 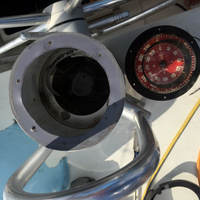 The second photo shows the binnacle after the compass was removed. The last photo is a close-up of the same thing. We are so happy to know the source of the problem...and also grateful Dito can fix it. 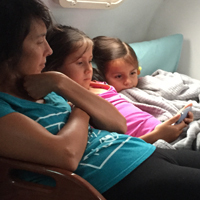 We all love the water, but not in our bunks, clothing, books, shoes, etc.! Saturday, 23 February 2019...No school today, so everyone found different things to do. I went grocery shopping to replace the food we used at the hotel in the past week. 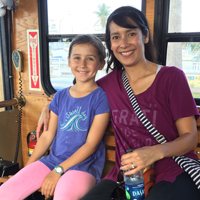 Sarah took the girls to the Saturday Market, then to see a parade that went right by the market and the marina. The stars of the parade were an equestrian group that performs with whips. The girls got to "meet" the horses and pet them after the parade ended. 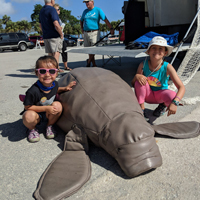 The Manatee Center sponsored an educational event to teach the public, especially children, about how they can help protect manatees. 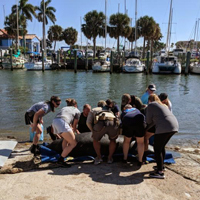 The Center even staged a mock manatee rescue using a "mock manatee”. 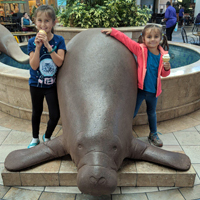 Children were asked to volunteer to help lift the stretcher the “mock manatee was lying on. Z and J were right there in the middle of the group that was supporting the ”injured manatee”. Remember the real manatee rescue I wrote about? The leaders of that rescue told today’s crowd about that specific rescue as well as a couple of other rescues that occurred recently in Ft. Pierce. They were able to tell the crowd that the rescued animal with the pneumothorax is presently recovering at the University of Miami. 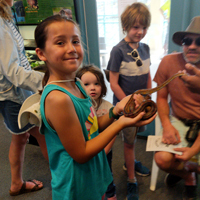 Other exhibits at the manatee center introduced the girls to a snake and a baby alligator! Big day! So, , another week (the 6th week since Dave fell) has gone by. Another day following our “new” routine... we did school first thing this morning, I made lunch (tortilla stacks and tossed salad), then, we were on our way to eat lunch with Dave at the motel. Next, more swimming in the pool. The kids' swimming proficiency is certainly improving. In the late afternoon, I stayed outside to make a phone call. When I finished the call, I went into the motel room. I could never have guessed...Dito was playing old video from our circumnavigation trip. Everyone was watching! I started watching, too! We agreed to pause the video and to go pick up pizza and garlic knots for supper. 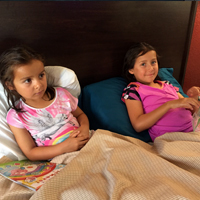 Back at the motel, we all ate our pizza while we continued to watch our old videos. For instance, in October 2004...We had sailed to the island named Kalimantan/Borneo with South African friends on their boat, Sea Tjalm. 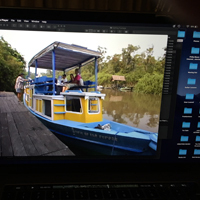 We all went on a day trip together...on a river boat up a river into the jungle to the site of an orangutan reserve. Our tour group saw several orangutans up close and personal. We have not seen this footage for a very long time, but watching it made the memories come flooding back! We have never forgotten visiting the orangutans! 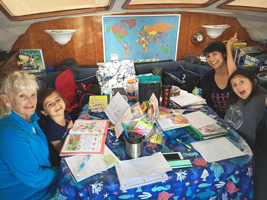 Started the day as usual, with school on the boat. Sarah made curry and rice for lunch today, then packed it up to take to the motel so everyone could eat lunch with Dave. I decided to stay in the boat and eat my lunch while everyone else went to the motel. Since Dave moved to the motel, I have been going back and forth between the two locations almost daily. I have kept a minimum amount of clothes at the motel. 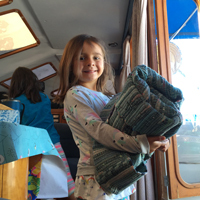 I got some clean clothes off the shelves in the cabin and dropped-off dirty clothes on the boat bunk everyday this week. It was time for an intervention! I cleaned up the cabin and put everything away in its proper place. Next, I went through some of the school materials I had squirreled away for “later”. 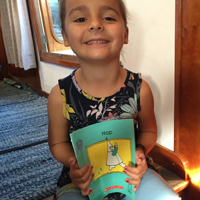 When J started home school, she was doing pre-school to beginning kindergarten level work. 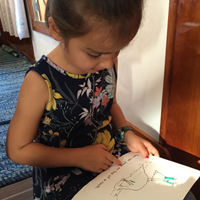 Now she is starting to read, do math, etc. Time to pull out some of the materials. “Later” has arrived! Next, I rearranged some things in the food pantry. I worked all afternoon and got most of the things done that were on my list. Meanwhile, at the motel, the kids were swimming with Dito and diving down to retrieve rings Baba was throwing in the pool. The kids hardly notice which end of the pool they are in anymore. 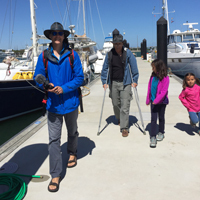 Dito, Sarah, Z, and J returned to the marina about 1730 (5:30 p.m.). 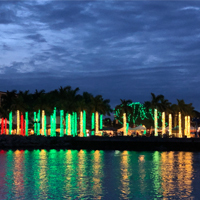 I took the first 2 photos in front of the marina building while waiting for them Dito took the picture of me waiting, then they went to the boat and I returned to the motel in the car. 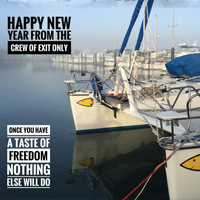 Good news was waiting for the crew of sv/EXIT ONLY at the marina office this morning! We get to stay on A dock for four more weeks! I was really nervous going into the marina office this morning around 0830 (8:30 a.m.). 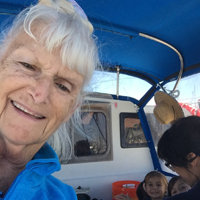 The lady said she had not heard from the marina manager and the dock master what had been decided about EXIT ONLY. She asked me how I was doing and I told her I was waiting to hear about the decision before I knew how my day was going to go. She made a phone call and found out they are going to let us stay. Wow! We are so grateful...and relieved. I felt like I could breathe again. I have told y’all about how the motels, Air B&B, etc. are all full in central Florida right now. We can add “marinas” to that list. They are full, too! This week is number 6 of “no weight bearing” for Dave. Two weeks from today, 6 March, Dave will see the doctor. So, two more weeks until another x-ray will be taken. This was also library story time day. 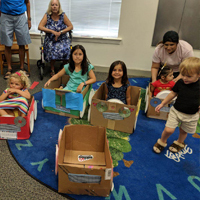 The photos show Z and J participating in today’s activity...making “cars” out of boxes. Once the “cars” were done, they kids lined up at the “drive-in movie” to watch a movie! We especially liked the idea that one of the “cars” was a Land Rover! The daily routine has changed with Dave staying in the motel. Before I head to the marina for “boat school”, Dave eats cereal for breakfast and takes his shower while I am still at the motel. Once he is set for the day, I drive 10 minutes to the marina, walk 5 minutes on the dock out to the boat, and school starts shortly after that. To add “an extra thing to do” to this day, I had to stop by the marina office before heading out to the boat. The “grace” month they already gave us to stay at A dock is up 21 February...Thursday. 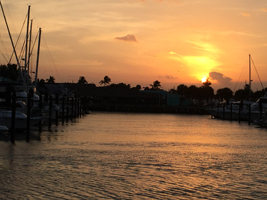 The lady in the office told me they have 12 boats arriving Friday the 22nd and the marina does not have room for us to stay...BUT...there is going to be a marina meeting later today and our situation (with Dave unable to get on the boat) would be discussed. She told me to stop by tomorrow morning to find out what had been decided at the meeting. I managed to stay calm...there is nothing else I can do to influence the decision...there will be plenty of time tomorrow to panic if the decision does not go our way. 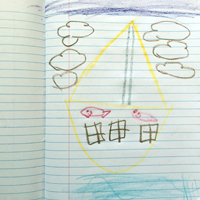 With all of this on my mind, I decided to post a photo of the open dock area immediately near our boat that will be filling up soon.Then, I added a couple of fun photos of drawings the kids did...Z’s drawing of one of the Ft. Pierce peacocks and J’s drawing of sv/EXIT ONLY (plus sharks!). We know today is officially a holiday, but we decided to continue our usual routine and have school this morning. I had dropped Dito, Sarah, Z, and J off at the marina last night and drove the car back to the hotel.. This morning I drove myself to the marina in time to teach school. After school finished, Sarah made lunch. We packed up the food and loaded it into the blue wagon so we could eat at the motel with Dave. Y’all can see everyone walking on the dock with the blue wagon as we walked out to the car. 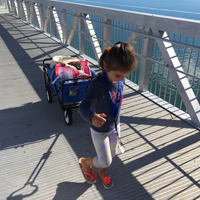 J is pulling our version of “meals on wheels (wheels of a blue wagon)”. 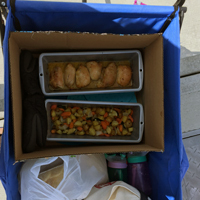 The last photo shows what was on the menu today...maple Dijon chicken, roasted vegetables (potatoes, onions, carrots, zucchini, and eggplant). The girls got in some more pool time after lunch! Someone asked me about the photography equipment Dito was using for the underwater photos and the half-in-water/half-out-of-water photos. 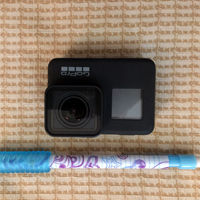 The first photo shows the small size of the GoPro 7. Because it is so small, it is easy to carry everywhere your go. The camera is with you whenever you want to use it. 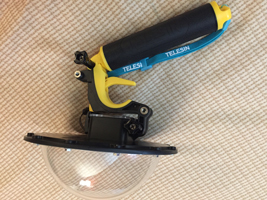 The second photo shows the Telesin dome-shaped waterproof housing that surrounds the camera. The handle on the housing extends like a selfie stick, so everyone can be in the photos. Dave made the third photo using his own design around one of the photos taken today. The motel’s swimming pool is an added benefit for us! The water temperature is in the high 60’s. The air temperature is in the mid-high 70’s. The kids love it! 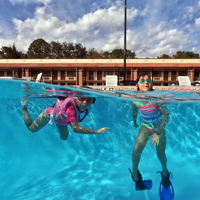 The girls have not had a chance to practice their swimming lately, so yesterday they played in the shallow end most of the time and would not go into the deep end (6’). 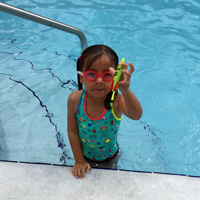 Today, after practicing camera shots with their dad, Z was encouraged to swim the length of the pool underwater using her fins. After a couple of attempts...she did it in one go...many times! J was watching and got into the pool and swam on top of the water the length of the pool...6 times! They are back! (O.K., I will admit Baba did promise some M&M’s). 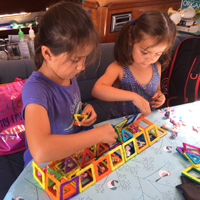 It is so important that the girls be comfortable in the water and have confidence in their swimming skills...especially when they live on a boat! The pool is also giving Dito a chance to learn to use his camera equipment before we leave. We are very grateful for that pool! Settling into the motel yesterday was quick and easy. I had already shopped, so “provisions” for the motel were already in the car with us when we first arrived. This motel does not serve breakfast, so I had stocked Dave’s favorite Mini Wheats among other things. No problem! We came up with a short list of 7-8 things we wanted to add to the “provisions”, so I drove to Walmart this morning to shop. I want Dave to be able to fix a simple sandwich or snack for himself when I am not at the motel. The rest of the crew came over after lunch to go swimming in the pool. 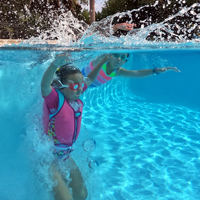 Today’s photos were taken by Dito with his waterproof GoPro camera in a special bubble housing case that is also waterproof. Using this set-up, he can shoot photos half in the water and half out of the water. He also used the waterproof GoPro by itself to shoot underwater photos. 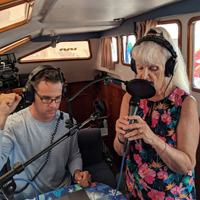 This was an opportunity for Dito to learn how the equipment works and practice different ways of using the camera in the water. Everyone was pleased with today’s results. 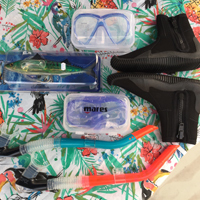 We are looking forward to using the camera in tropical waters! 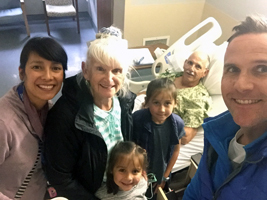 When I woke up this morning, I knew today’s story would be about Dave leaving the physical therapy center and moving into a motel room...and that is exactly what happened. The surprise came when we saw the motel room. In the past week, Dito and I went to 7 or 8 motels asking if they had a handicapped room available starting 15 February. Everyone told us “No, it is high season and most of our rooms are booked!” We discovered it is also “soon-to-be-peak-high-season” due to baseball teams coming here for spring training. After we kept hearing this same answer to our question, we started asking for a “regular” motel room that we hoped we could make work for Dave. Long story short, we finally found a motel that would rent us a room for two weeks, then let us rent it for 2 more weeks after that. We booked it sight unseen. It was truly our only option in Ft. Pierce. All of us went to help move Dave after lunch today. We asked him how he wanted to celebrate his Great Escape. He wanted a mini Sonic Blast...so, off we went. By the time we ate the Blasts and picked up meds at CVS, it was time to check in to the motel. Dave was assigned to room #106. Can you imagine our total amazement when we saw the room had a laminate floor (much better than carpet for a wheelchair), a support bar around the toilet, and a support bar in the tub/shower!!?? 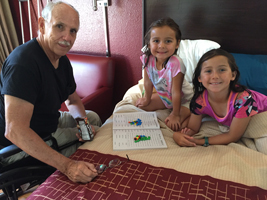 We ended up with the only motel room in Ft. Pierce, FL, that is not a handicapped room, but it USED to be one! Can you believe that? What an answer to our prayers! I will be staying with Dave tonight while the rest of the crew will stay on the boat. Here we go...on to the next phase...”we’ll just keep doin’ what we did when we didn’t know better!”. We enjoyed blueberry muffins for breakfast this morning! The first photo shows the leftovers. 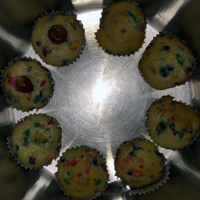 Yes, you are seeing sprinkles in the muffins! Those sprinkles are a personalized touch for two girls who love sprinkles! The maraschino cherries are also a favorite of those same two girls. The second photo is My Valentine! We did not forget to give him chocolate treats! 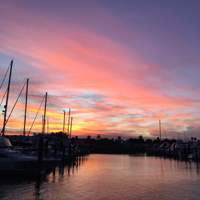 Dave will be leaving the physical therapy center tomorrow morning and moving into a local motel that is an eight-minute drive from the marina. I will be staying there with him at night, then returning to the boat by 0900 (9:00 a.m.) for school on Monday through Friday.. I teach J (kindergarten) while Sarah teaches Z (second grade). Dave is still not supposed to bear weight on his hip/leg until he sees the doctor on 6 March. He will be in a wheel chair or on crutches until then. He also will have a walker and a shower chair to use as needed. So far...so good! The third photo is a fun photo taken earlier this week. When we all visited Dave, the girls were jumping rope. Then, they decided to try to do the limbo. Baba did it, too! The first photo was taken in the morning. The second photo was taken in the afternoon. These two photos tell the whole story...the rain lasted aaalll dddaaayyy lllooonnnggg! 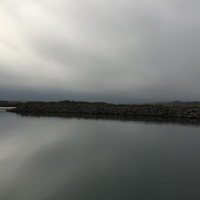 There is something about being on a boat on a rainy day! There is water under you, over you, and all around you. If you are inside the boat, the dampness is a real thing that sort of oozes into the fabrics (rugs, bedding, etc.) and clothing. Conversely, if you are off the boat and in the wind and rain, coming back on board and getting inside the closed door can make you feel so grateful be warm and dry again! 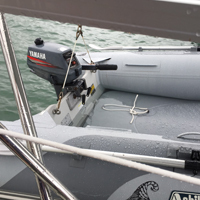 Nobody wants to go out on deck to do a boat job when it is raining, but if something needs immediate attention, one or two crew members will be going to check on the situation...then, if necessary, they will solve the problem. 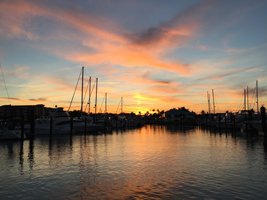 Some of the best sleep comes when the boat is safely at a dock or anchored well. No better time to curl up with a hot drink and a good book,..or take a nap...than when it is raining! The last photo shows me making a treat (blueberry muffins) for Valentine’s Day breakfast tomorrow. 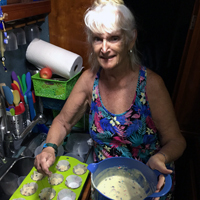 The oven was also spreading some warmth inside the boat while the muffins were baking! Thanks to the south wind with just a tad of east wind, the storm clouds have been held at bay all day. 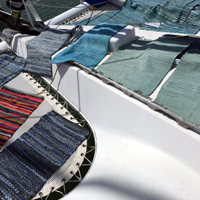 That meant we could pick up the throw rugs inside the boat and lay them outside on the foredeck (deck area to the front of the boat). The wind and the sun dry out any dampness in the rugs. After a few hours out there, the rugs feel warm and feel fresh! While all of the rugs were outside, Sarah was using the 12 volt DustBuster to sweep the floors inside. 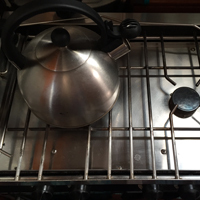 I was heating water for coffee and tea first thing this morning, when the burner on the stove suddenly lost its flame...the propane tank was empty. Dito disconnected the tank from the hose that runs to the 2-burner stove (plus oven) in the galley (kitchen) and carried the tank to the propane shop where they refill tanks. 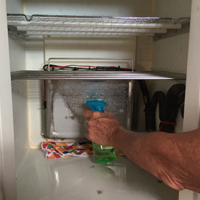 When he returned with the full tank, he reconnected the hose to the tank and the stove was operational again. 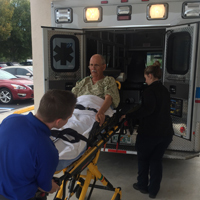 We have spent a few hours over a few days going to motels in the Ft. Pierce area looking for a ground floor room for Dave. He will be leaving the physical therapy center on Friday, the 15th. February is not only high season in Florida...it is PEAK high season going into March. Some of the Major League Baseball teams (the ones that do not go to Arizona) come to central Florida. It has been impossible to reserve a motel room for four weeks. We finally found a motel that would let us sign up for one week beginning the 15th. One day at a time leads to one week at a time. Hopefully, it will turn into one month at a time! (I did not send pictures today since we are posting the “Acetabulum Rap”). Y’all can watch Dito’s video by clicking on the accompanying photo. Today has flown by! I spent the morning visiting with Dave. He does not have physical therapy on Sunday, so we planned two visits today...morning and afternoon. After lunch, we shot the music video, both inside and outside the boat. This video will go with the pre-recorded voice track of the “Acetabulum Rap” (The acetabulum is the bone Dave cracked when he fell.). I did not know what to expect, but soon discovered the idea was to have fun with it...and if you miss a word or two, just keep going! P.S. 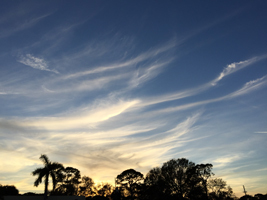 I added two of my favorite Florida sky pictures today...just because I like them. The sunset makes the clouds look like “fire birds”! Another Saturday means it is another Saturday Market! 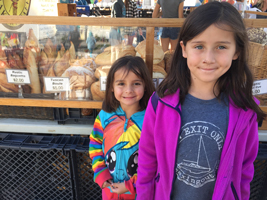 Here are the girls at our favorite French Bakery booth. I always buy fresh baguettes to share at breakfast. Z always chooses a chocolate croissant, and J always chooses a big blueberry muffin. Also, bought a pastry for Dave and some fresh sweet peppers and cherry tomatoes. After lunch, we had a drama unfolding out near us on A dock! 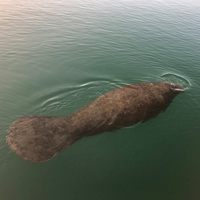 Evidently, a manatee was injured when a boat motor propeller hit it while it was in the marina area today. Fish and Game came out in two boats to check on the manatee. They said (later) that the manatee had a pneumothorax. 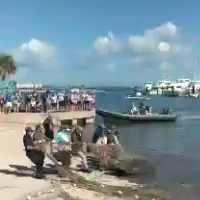 They put a diver/swimmer in the water with the injured animal. Using a net loosely placed around the animal, they slowly worked their way to the Manatee Center (across from the NW corner of the marina...we are on the east side). Dito was one of the volunteers who helped lift the manatee (on a tarp) out of the water and put it into the furniture moving truck that would take it somewhere to have surgery to repair the injury. (An official said the manatee weighed about 1,500-1,700 pounds!). They are mammals, so do not have to be immersed in water while being moved. The officials said the prognosis for the “patient” is very good! I wake up every morning wondering how the day will unfold...and what sorry/stories I will decide to share in my blog today.l. Many times the kids have heard me say, “That will be my story today” after I take a photo. They are starting to look around and give me their ideas for “my story”! The next photo was taken in the drive-through lane at Wendy’s. 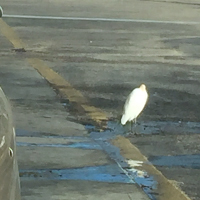 The egret was there and did not move away as the cars rolled up to the window to get their orders. We stopped to get Dave a Frosty! Friday night is Movie Night, so the evening ended with popcorn and a movie about cartoon penguins. I was working on lesson plans for school next week, trying to do two things at the same time! After school this morning, we discussed “the plan” for the rest of the day. Long story short, everyone wanted to go to the beach on this beautiful warm day. 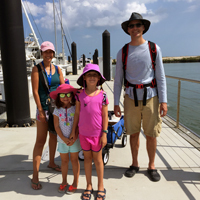 We got ready, picked up our favorite sandwiches from the Publix (grocery store) deli, and headed for a lovely public beach on North Hutchison Island. Z and J met two sisters from Pennsylvania who are the same ages they are. It was “friend at first sight”! 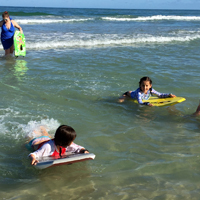 They all had boogie boards, and soon they were all riding the waves off a sandbar at low tide! J is on the white board and Z is on the yellow board. 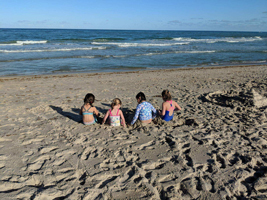 I think the photo of the four girls with the sand castle and the ocean really tells the story. 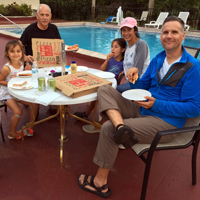 After we cleaned up from the beach, we ordered a pizza, and went to see Dave. 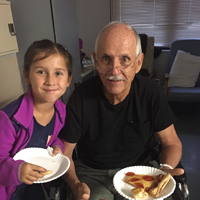 He was especially glad to see the pizza! 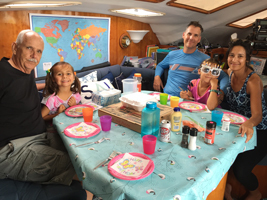 (We cook and eat a lot on the boat, but today did not allow time for that!). Sarah took the clippers and cut Dave’s hair out on the patio. That made us remember the time in Finike, Turkey, in 2005, when I was cutting Dave’s hair with scissors and a comb on shore. Two young men walked by, paused, then came back to tell us that they were both barbers and I was doing a poor job on the haircut. They took the scissors and comb from me and proceeded to cut Dave’s hair! It was a good haircut! The sunny weather has.returned with a flourish! That is A dock going east before it turns north. I was standing in the plaza where the palm trees are located. I really like reflection photos...the clouds, are pretty fantastic, too! Y’all can see the cutting continues on the fish for our bow graphics. This time Z is helping out. 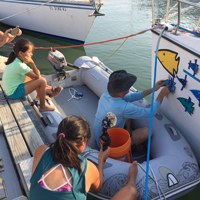 We went from planning to put 6 fish on the outside of each bow to thinking we would like 6 fish on the inside of each bow, too. We ordered more rolls of vinyl! We are going for it! Dave saw the doctor today. They took an x-ray. Dave did not see the x-ray, but they said the crack is aligned like it should be. It is too early to actually see healing. The report was as good as it could be at this time. Dave’s next doctor’s appointment is in four weeks. So far, so good! P.S. Dave did get a Wendy’s Baconator sandwich and a Frosty! 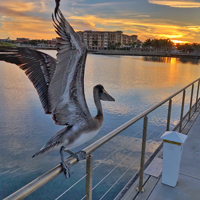 One of our favorite things about walking on the A dock (we walk on it to get to the marina building and and the downtown area) is looking to see what birds are hanging out near or on the dock. Most of the birds seem to be territorial and go to the same areas again and again. All of them used to fly away whenever we sort of came near them. Now, they seem to recognize us and do not move when we go by. 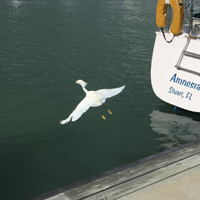 The snowy egret did fly from the dock when I moved directly toward him and “invaded” his space. 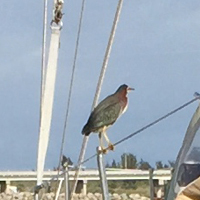 The green heron was resting on the boat behind us at the dock.Both of these birds like to balance like an acrobat on the dock lines leading to the boats and “go fishing”. They wait for their meal to swim under the dock line and quickly dart their head into the water to swallow their food. 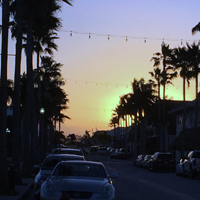 In the afternoon, we ran errands in Vero Beach (20-25 minutes north of Ft. Pierce). 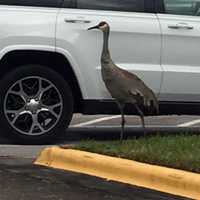 Right there in the parking lot, two sand cranes were walking around the vehicles. Dave is doing well. He is in his fourth week of non-weight bearing on his left leg/hip. He has an appointment with the orthopedic doctor tomorrow. Dito is going to pick him up and take him to the doctor. Something tells me there may be a carry out lunch or some ice cream that just happens to be located on the way back from seeing the doctor! 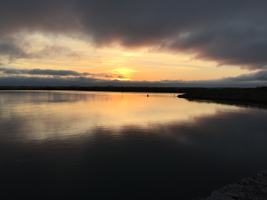 Here is the sunrise I saw this morning as I walked along on A dock up to the marina building about 0710 (7:10 a.m.). I thought the clouds looked like a giant seashell that opened to show the rising sun, looking like a “pearl” inside the “shell”. 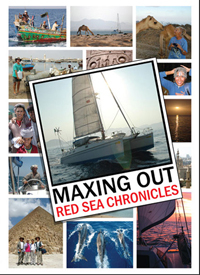 The second photo was taken later In the afternoon when part of the crew went for a ride through the marina in the dinghy. The last picture shows the portable IKEA swing, called a “Gung Gung”. Dito and Sarah brought it to the boat from Kentucky. 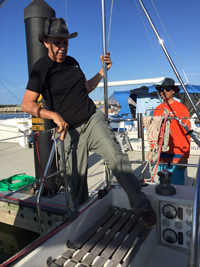 Dito secured the ends of the swing to one of the halyards (a rope used for raising and lowering a sail). The kids had a lot of fun taking turns riding in the swing! Dave was back to his physical and occupational therapy schedule today. We were able to visit with him outside again, so we all enjoyed that. It all started out with the idea of taking a donut to Dave...and we did that. 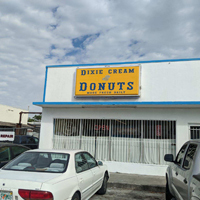 We made the drive to Dixie Cream Donuts to our favorite donut bakery. We all went in to see what kinds of donuts were still left on the shelves. The bakery is open from 5:00 a.m. in the morning to 2:00 p.m. in the afternoon. Since it was after 10:00 a.m., the morning rush had come and gone...carrying out many, many donuts. 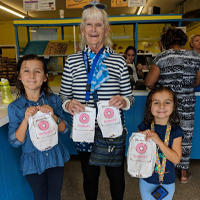 There were many empty trays, but still enough donuts left to give us a good choice. We all picked one to eat when Dave ate his! 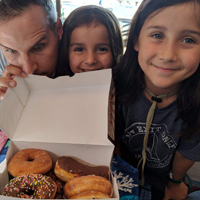 These are some of the best donuts we have ever eaten! 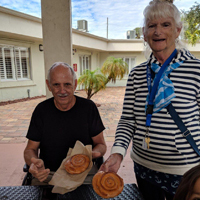 When we got to the physical therapy center, it was sunny and we were able to sit outside and enjoy our donuts. 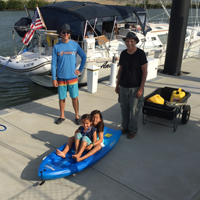 In the afternoon, Dito, Sarah, Z, and J took the dinghy out for a run around the marina. It is always good to regularly use the engine and make sure it is running well. Because the day was sunny and the sky was blue, there were many boats coming and going in and out of the marina all day long. Dave did not have physical therapy today, so we took turns visiting him and he ended up having some of us visit in the morning and others visiting him in the afternoon. That helped his day pass quickly. In the evening, Dito found the Super Bowl football game being streamed online, so we watched that in the evening. We are not big football fans during the regular season, but it is always fun to watch the big bowl games. 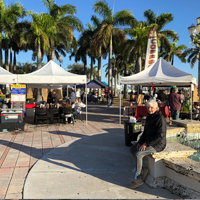 Every Saturday is Market Day in the plaza (right by the marina) in downtown Ft. Pierce. I have showed photos of the market before, but today I was inspired to take more photos. There was a large crowd and every booth seemed to be busy, the band was playing, and a few people were dancing to the live music. The people were smiling and talking. It seemed like the sunshine (after all that rain) was calling to everyone to come outside...and they came...and they were happy to be there! 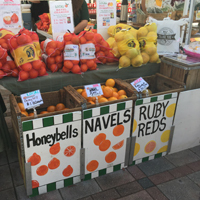 You can see the beautiful French breads and the local citrus fruits that were for sale. The third photo shows everyone (...even me! I am reflected in the glass door!) on the outdoor patio at the rehabilitation center. Now that Dave has a roommate who is not well, we do not go to the room to visit. This was the first time Dave had been outdoors in seven days due to all the rain that fell between then and now. What? Already? For sure? Today was our official 100th Day of School? At first, celebrating with 100’s sounded great to the kids...100 Cheerios for breakfast...100 fish crackers for snack...100 M&Ms (y’all remember Vitamin M? )...but, reality soon set in...100 pieces of fruit salad...100 grilled cheese sandwiches...well, you can see this could quickly get out of hand! A vote was taken and it was unanimous...Mini Sonic Blasts won! That is SIX Mini Blasts (not 100!). We bought them, then drove to see Dave so we could all celebrate together! I really do not want to tell about the north wind again, the rain, and the layers of clothing we are wearing, but...this was another “one of those days”. I had a change of perspective as I read on internet about those impossible-to-believe temperatures that people up north are having to contend with. Compared to their weather, ours is “almost balmy”! We visited Dave today at the usual time and found him in the physical therapy room doing his exercises. He was using a 6 pound bar and doing 300 reps. The therapist said less weight with more reps was better for him than more weight and less reps. The kids got in on the action, too. Dave got a roommate today, so we sat in the empty dining room to visit. 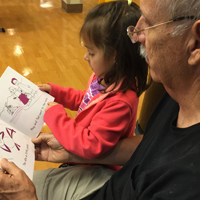 J was reading her books from school this morning to Baba. You can see into the physical therapy room in the background. Dave is certainly feeling stronger in his upper body. He is not in any pain. His main job is to heal right now. The next big step will be weight bearing on his injured hip/leg. After we finished school this morning, Sarah, Z, and J went to the library for story time. The first photo shows Dito out in the cockpit typing while we did school in the salon. He is writing a book...fantasy genre. Y’all can see he was challenged by the north wind. It was chilly out there. He agreed to help me get the laundry up to the marina building (after I pointed out it was much warmer up there in the laundry room). The second photo shows what I saw when I went outside the laundry and tried to take a photo looking in the window. 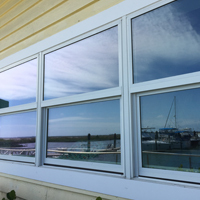 The window is coated and reflects the sunlight and the scenery. The third photo shows Dave demonstrating what he has learned about stretching his legs without bearing weight on the left leg/hip. Z and J are trying it out, too. Dave calls it “the flamingo”! We are often asked what we do all day. I have shown and discussed quite a few of the routine things we do. 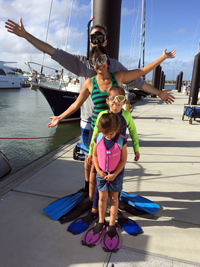 We have been so busy getting ready to “sail away” that we have not had a lot of “down time”. Now that our plans are “paused”, I thought I would show y’all what Z and J like to do sometimes...give me a fancy new hairdo! What do you think? 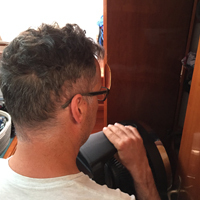 We have the usual jobs to do...meals, washing dishes, cleaning the galley and cabins, sweeping the salon and hulls with a 12 volt DustBuster, etc. Very necessary, mundane activities. Added to these jobs, we have the boat-related jobs...keeping the water tank filled, running the engines regularly, drying out everything that got wet in the rain, etc., etc., etc. Add in time for home schooling on Monday through Friday and the days seem to fly by. We are using our “extra” time at the dock to refine some of the ways we are using storage space and rethinking some of the choices we made...(for instance, we have all added some warmer clothing!). So, that is all part of what we do all day. Everyday is different! Woke up this morning to the wind blowing NNE straight from our stern into the cockpit, but...there was no rain! The same wind that drove the rain into our cockpit was drying everything out! Morning was chilly, but compared to the middle of the USA, we have realized we are fortunate to have the temperatures we have. It could be (and many places actually are!) a lot worse! 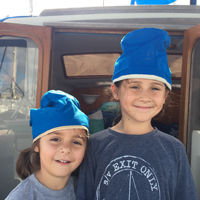 After we finished school, we bundled up and headed off the boat for a few hours. We dropped Dito off to spend time with Dave. 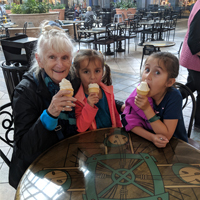 The ladies went to the mall at Vero Beach to have lunch and see “Mary Poppins”. After the movie, the sun was shining! The people who had been so cold, decided to have ice cream at the food court! Dave had called and asked for Diet Dr. Pepper and more Vitamin M (M&Ms). He is fed at the facility, but seems to enjoy the homemade food and treats we bring, too. His first day of physical therapy went well. He was happy that they started teaching him exercises for his injured leg/hip to prepare for weight bearing in a few weeks. The first facility only worked with his upper body and good leg. Dave is definitely feeling stronger! The steady rain started falling at 0300 this morning. It is still raining 16 hours later...and the forecast is for more rain until 0600 tomorrow morning. The good news is it is dry and “warmish” inside the boat. Winds were varying all day between 15-25 knots. Right now, our anemometer shows 32 knots. We are tied to the dock, but the boat is moving a lot. The first photo shows Dito lowering one end of the dinghy to allow the accumulation of rainwater to drain out (he lifted the cap off the built-in drain hole and the water drains out there). 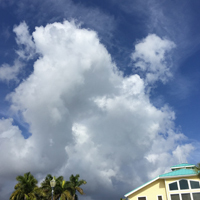 This photo also shows the sky to the north (the direction from which the wind and rain are coming). The second photo is a close-up of the water draining. 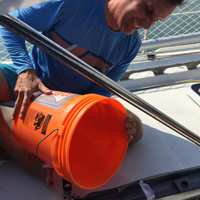 We drain the rainwater because the extra weight of the rainwater in the dinghy puts extra stress on the davits. 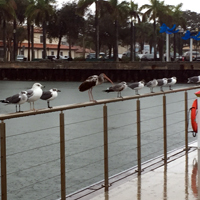 The third photo caught my eye, because one of these birds sitting along the dock in the rain is definitely NOT like the others! First time we have seen an ibis sitting there! Dave is doing well. He will start his new physical therapy and occupational therapy schedule tomorrow. More north wind and rain showers off and on in the afternoon...more wearing fleece jackets and hats today! Our water tank was empty, so between rain showers, Dito and Z filled the tank. The white hose is used only for potable water. Dito attached it to the faucet on the dock. 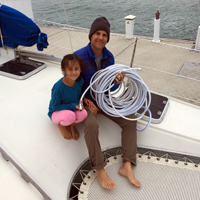 They let the water run for a few minutes to clean out the hose, then Z put the nozzle of the hose into the opening in the foredeck that goes to the water tank. The top to this opening screws down flush with the deck. Dave moved to the different facility today. This one is privately owned. He was evaluated by occupational therapy today. Physical therapy will do their evaluation on Monday. The physical rehabilitation program at this facility is considered “advanced”. Dave will have sessions Mon.-Sat. The therapist he saw said he would recommend 4 weeks of therapy. We are grateful for that, because four more weeks will be the end of the six weeks of no weight bearing. The orthopedic surgeon said he expected to see signs of healing by then. We had a pizza party tonight! 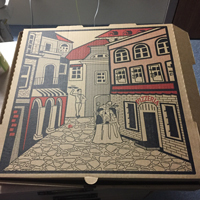 We decided two days ago to bring Dave pizza on Friday, but as of today, we called it a “celebration”. 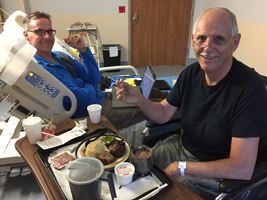 Dave was told today that arrangements had been made to move him to an “advanced” physical therapy center tomorrow. 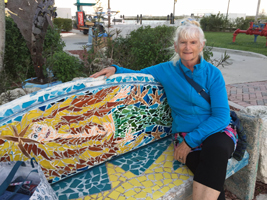 We are very grateful the caseworker found a place right here in Ft. Pierce, about 6 minutes drive from where he is now. We do not know how long he will be in the second facility. Hope to get more information tomorrow. The north wind returned today, so once again it was time to pull out all those layers of clothing before we went out to Walmart and Aldi. We did all that provisioning in preparation for leaving, and now, we are sitting here eating the food we planned to eat “out there”! We keep a running list of the provisions we are using. That way we know exactly what has to be replaced when we go shopping. The plan is to replace what we are using and be fully provisioned when the time does come to leave. 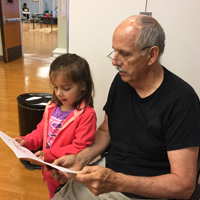 Dave got his 10-day evaluation results from physical and occupational therapy yesterday. 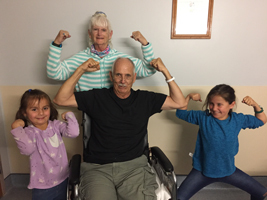 He has shown excellent improvement in strength and balance. 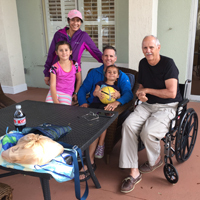 If we lived near-by, we think he would be sent home to continue outpatient physical therapy. Because he lives here on a boat right now, the case worker said they are trying to find a place for him in an “advanced physics therapy” facility in this area. He will continue doing non-weight bearing exercises for at least 4 more weeks. We go visit Dave everyday after 3:30 p.m. (when visitor’s hours begin). The picture tells the story ...Dave spends his days out of bed in a wheelchair. He was eating his supper. Dito was reading. Sarah and I were sitting in two chairs looking at our phones. The girls were making “pizza” and “little people” out of Baba’s exercise putty. 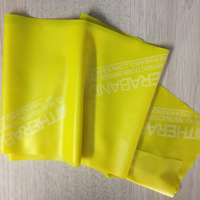 The bright pink putty and yellow exercise band are the main strengthening tools Dave has used. He will be able to continue using them when he gets back to the boat. It was blowing hard all morning, then a small squall (rain shower) came through. After that, the wind immediately dropped off. As I write this tonight, it is absolutely silent...no wind at all...no sound at all! 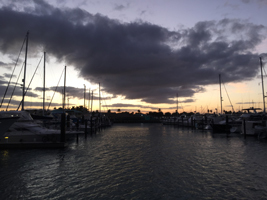 I walked around the marina area in the afternoon looking for views I have not shared before. This is the front (or street view) of the yellow marina building. 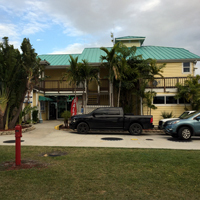 The main office, a gift shop, showers and restrooms (for marina residents only), and a fully equipped kitchen (also for marina residents only) are located in this building. 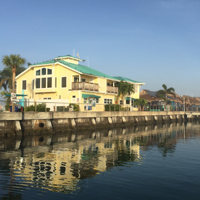 The second photo is a view of another section of the marina to the north of the yellow building. We are in a section of the marina located to the east of the building. 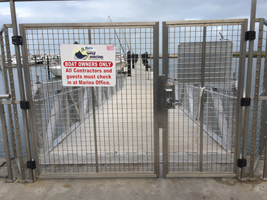 The last photo shows the security gate we go through to get to our boat. You can see A dock stretching out a long ways eastward. At the end of this part of the dock, the dock makes a 90 degree turn and goes on for a long ways to the north. EXIT ONLY is located on the northern part of A dock. It is a bit of a walk, but is also good exercise! The memorable “very cold” day yesterday ended with the north wind veering more N of E and temperatures warming up a tad. The sunset was dramatic! In the night, I could feel the boat pulling differently on the dock lines. 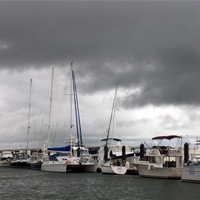 The wind was howling through the rigging on all the boats in the marina. By this morning, the wind had moved and was coming straight onshore from the east. The temperature was definitely warmer. 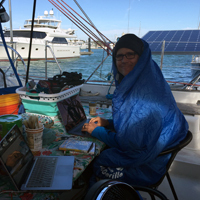 I was so happy about the warmth that I did not complain about the wind blowing 20-25 knots, gusting higher...it blew all day and is still blowing as I write. 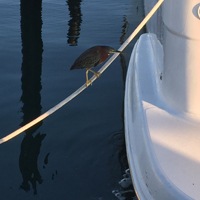 It was blowing so hard that the green herons were not “fishing” off the dock lines like they usually do. The last picture was taken at a stoplight on our way to the boat after visiting Dave today. What a difference a day makes! The north wind started blowing during the night and it was cold! It was 40 degrees when I woke up this morning. 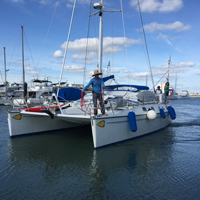 The boat was moving on the dock lines in the 20-25+ knot wind. 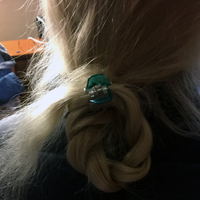 (A knot = 1.151 miles per hour.). We have enough bedding in the cabins to keep everyone warm and cozy through the night. The real challenge when it is cold, is getting out of that warm bunk! It can be slow going! We dressed in layers and drank hot chocolate, tea, or coffee. We did do 2 hours of school with the girls. Our hands and feet were cold, but we made it! After that we decided to get off the boat and do errands in Vero Beach (17 miles north of Ft. Pierce)...inside warm buildings! The first picture shows how warmly dressed everyone was. We only have limited warm clothing on board, because we are supposed to be headed to the Tropics. I did not have any shoes I could wear with socks, so you can see the ones I bought (and put on immediately) today. They are much warmer than sandals or boat shoes. Stopped to see Dave on our way back to the boat. He is doing well, as you can see. 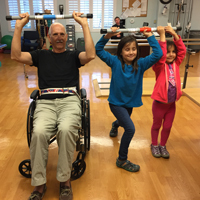 Today they worked with him a lot on core strength and balancing on one good leg while standing to do something. He is doing 3 hours of physical and occupational therapy each day. 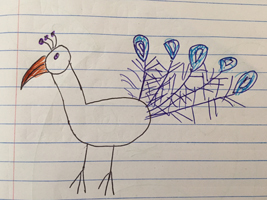 Remember the “Peacock Crossing” sign? 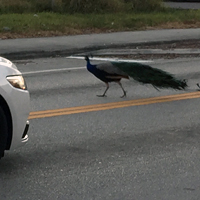 We always try to drive on Orange Avenue when we can, so we can look for peacocks. This weekend we were driving on Orange Avenue. It was dusk and we were on our way back to the boat after visiting Dave. 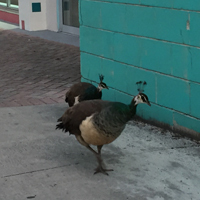 There were peacocks and peahens walking down the sidewalk and crossing the street. We wondered why there was so much action. Where were they going? Now, we know...it was time to sleep! Where do they sleep? Up in trees! It makes me smile to see these birds so up close and personal! Dave continues to do this physical therapy exercises. There are no formal sessions on Sunday, so he did his own workout. He is feeling good! 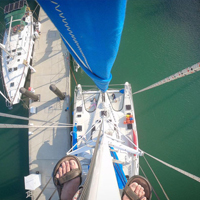 Dito took pictures when he went up the mast to check some of the gear yesterday. 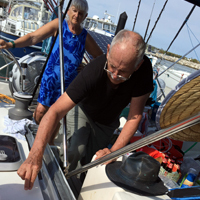 He also checked the foresail (front sail) that opens and closes with the roller furler (it makes the sail wrap around the forestay...the wire from the front of the mast to the bow of the boat that keeps the mast from falling backwards). He carried the pictures to the physical therapy center to show them to Dave last night. 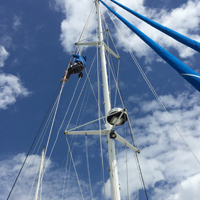 While studying the pictures, they were able to determine something at the top of the mast needed to be checked again and the foresail needed to be hoisted higher up, too. 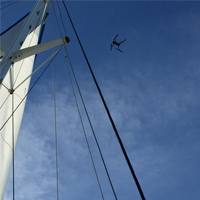 There was a very light breeze blowing this morning, so Dito sent his drone up to the top of the mast to show him the exact area he planned to work on up there. The next picture shows a view of EXIT ONLY’s deck below Dito from the top of the mast. The work up there is finished now. 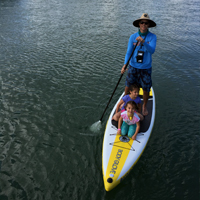 Later in the day, Dito inflated his fold-up paddle board and took the girls for a ride near our boat on A dock. Dave had 3 hours of physical therapy today. He said they worked mostly on balancing on his good leg while holding on to the walker with one hand and moving objects with the other hand. I think it was harder to do than he thought it would be. 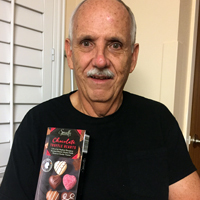 He is really impressed with the physical and occupational therapists he has worked with and he feels they do their jobs really well. Today dawned sunny and bright, with a very light wind blowing, and it was warmer! 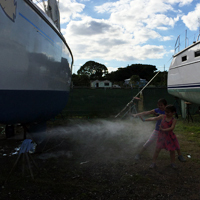 After school was done, we all pitched in and helped wash the cockpit and the foredeck of the boat. 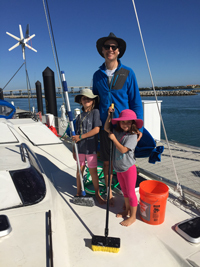 The warm sunshine made us happy to be outside cleaning up the boat. You can see the boat girls were swabbing the deck! We all visited Dave after lunch. We took Dave some M&M “vitamins” to give him a boost! 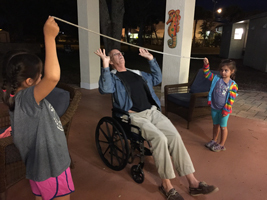 He was showing us resistance bands he had used in the physical therapy sessions today. He is working hard! Everyone started talking about exercises and balance, and arm strength, etc. The picture shows you how everybody except Baba and Gaga jumped up and started exercising! Dave had his first physical therapy sessions today. 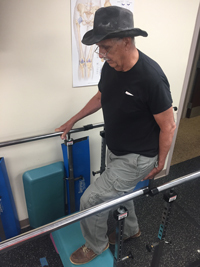 From what he told us, it sounds the like the physical therapists are trying to strengthen his core and arms to help support his right leg (the good leg) when he is using a walker. 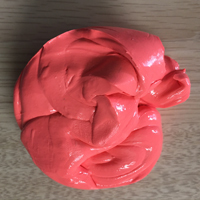 He was also squeezing green putty several different ways to strengthen his hands and fingers. 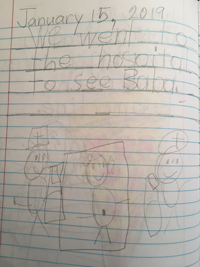 The girls wrote about Baba moving to the rehabilitation hospital in their daily journals. 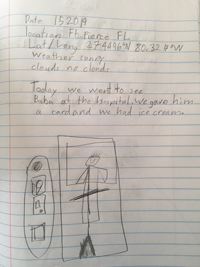 Each day during their school session, Z and J write about what is currently happening in their lives. They add an illustration below their writing. Busy day today. School was first thing on the agenda. 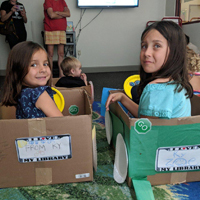 We did a shortened version of school, because today is also Story Time at the local library (right on the plaza with the palm trees). The theme of the stories today was “snow”. There are a lot of people who come to Florida to get away from the snow back home. Surprisingly, there is still a lot of talk about snow. The kids’ activities today included “making snow” by mixing baking soda and shaving cream. Once the proper proportions of the two ingredients were achieved, it was possible to form a “sort-of snowball”. It surprised me how cold the mixture felt! Another activity was putting glue on pre-cut snowflakes, then laying them in a plate full of glitter. 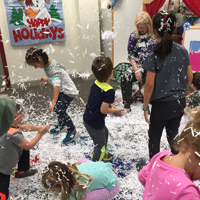 The third activity was a “snow storm” made of shredded paper the librarian has been saving for months! The kids really got into it...throwing it at each other, then laying on the floor and making “snow angels” (or should we say “shredded paper angels”)! 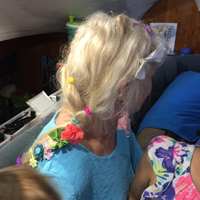 By the end of the session, everyone, including the adults, had shredded paper in their hair and on their clothes. We had to brush it all off before leaving the kids’ room to enter the main library. After lunch, we headed for the Rehabilitation Center. Dave had called and told us they moved him over there from the hospital about 12:45. Dito was with him and they let Dito ride in the ambulance with his dad. 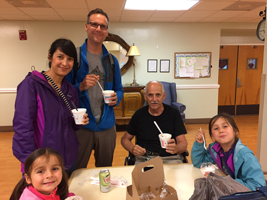 We did not stay too long at the rehab center, because so many people were coming to the room to take care of the admitting procedures and paperwork for their facility., Lots and lots of papers to sign, etc. “Boot Camp” (that is their name for the rehab center) starts tomorrow! Sarah and I did school with the girls this morning while Dito went to the hospital to be with his dad. 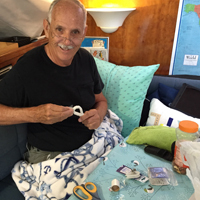 Dito returned for lunch on the boat, then we all returned to the hospital together. 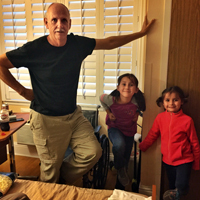 We were quite surprised when we got to Dave’s room to see him standing with a walker and a physical therapist holding on to a belt around Dave’s waist. He was standing on his good right leg and holding his left foot off the floor. He is not supposed to put weight on that left hip/leg for 6 weeks. 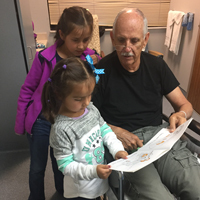 The people from the physical therapy department were there to evaluate Dave’s injury and possible response to rehabilitation. They told him in order to be admitted to the rehabilitation facility, he had to be able to do 3 hours of therapy each day. Evidently, he passed their test. They told him they would be transferring him to the rehabilitation facility tomorrow. 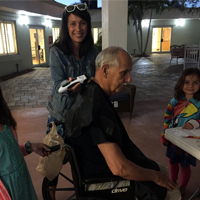 The facility is run by the hospital company and is located a very short distance away. This hospital is a level 2 Trauma center and needs their trauma beds for more serious trauma cases. It is good news that Dave is moving on from there. He is very happy about the move. Dito and I waited with Dave from 7:00 a.m. to 3:15 p.m. to see the orthopedic doctor. Today was his surgery day, so we expected a long wait. While we waited, they did move Dave from the ER to a room on the trauma floor. 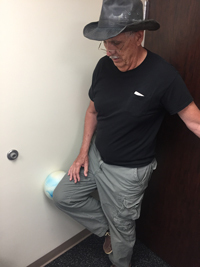 When the doctor did come to the room, the bad news was the hip socket was “cracked”. The good news was he did not say “fractured”. More good news was that he called it “light damage” and said it would heal by itself...no surgery needed! However, Dave cannot put weight on that hip/leg for 6 weeks. That definitely means he will not be returning to the boat for awhile. 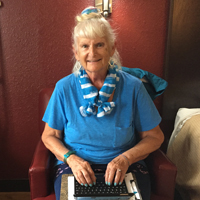 I am writing from the Ft. Pierce, FL, Lawnwood Regional Medical Center. Dave fell on the dock about 9:45 p.m. last night. His foot caught on a dock line while he was getting off the boat onto the dock. A CT scan showed cracks in the left hip socket. That is all we know right now. Dito and I are here with Dave (he is still in one of the ER rooms, because this hospital is so busy there is no room for him on the trauma floor yet.). We are waiting to talk to the orthopedic doctor to come check on Dave and tell us what the plan is. Y’all probably had an idea what pictures would be featured today! 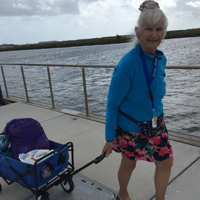 All those groceries from last night had to be unloaded from the car and loaded into the blue wagon and a marina cart. 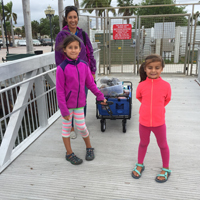 The carts were heavily-loaded, but Sarah and I managed to pull them out to the boat on A dock. 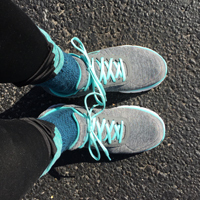 I may not be doing Jazzercise (and I do miss it! ), but I am getting my exercise! The groceries made it on board the usual way...everyone helped. You see Sarah and I down in the galley preparing everything for storage. She is cleverly coaxing each item inside the pantry into its special place...the one that makes the best use of the space available. Meanwhile, I am labeling cans, putting the amount of potato flakes we use for one meal into Ziplock bags, putting hot chocolate mix from a big can into individual servings in small bags, making a master list of supplies, so we can know what is located in each storage space. 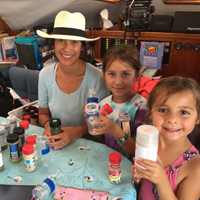 We try to think ahead so we do not have to open a large can of hot chocolate mix to have a hot drink on a passage while the boat is bouncing. Grabbing an individual portion of hot chocolate mix and pouring hot water from a prepared thermos of hot water makes having a hot drink while on watch at night easy to do without stress or making a mess. Really tired tonight, but feeling good about how much we have done! This week is going to fly by! 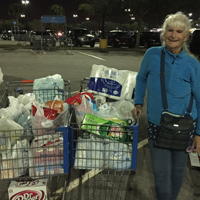 As the sun was setting, Sarah and I left the boat to face The Challenge (otherwise known as “the big provisioning”)....we went to Walmart to buy just enough food and other supplies to fill the spaces still open in the storage areas. Two hours later, we pushed two full trollies to the check out lane. One by one everything went into bags, the bags were put back in the trollies, and the trollies were pushed to the parking lot where everything disappeared into the back of the car. Back at the marina, we left everything in the car and plan to unload it all in the morning. It will be easier to face the “bigger challenge”: of putting it all away in places where we can find it again! Seriously, we do keep a running list of what is on the boat and what storage area it is located in. The big shopping trip is a sure sign we are getting closer to leaving. We will do one smaller shopping trip right before we leave for perishables...fruits and vegetables, bread, etc. Doing the “small provisioning” means our departure is imminent. We left our Costco purchases in the car last night, so first thing this morning, we went to unload the car. 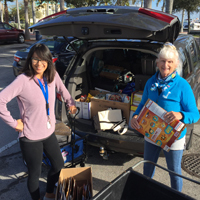 As we unloaded the groceries from the back of the van, we removed the packaging, flattened the cardboard, and put small items together in Ziplock bags. Those bags went into canvas boat bags. 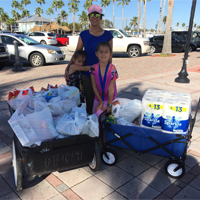 We filled our blue wagon plus one of the marina carts with all our “stuff”. Back at the boat, the crew formed a chain and passed everything from the dock to the boat. There is no picture of the next step...me labeling the cans and adding the information to the list of what is where in the galley while Sarah put the food away. The water make did arrive today. Will show pictures of that set up another day. North wind came in last night after the beautiful sunset took the warmer weather with it. I have been wearing warm layers all day. Sun is warm...wind is cold! More jobs ticked off The List today...Dave was back at the electrical control panel running wires to the new inverter. This will be used to run electrical current to the computers at the navigation station. 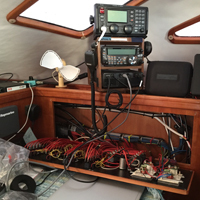 Dito was down in the starboard hull working on the other end of the same wires to the 12-volt system. 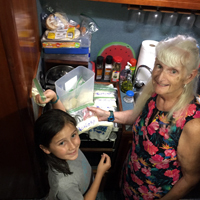 Sarah and I went through everything in the galley, checking the galley equipment on board as well as the food already stored in the pantry. Each thing has to earn its space! We rearranged some things, threw away some things, and made a list to get more of some things. 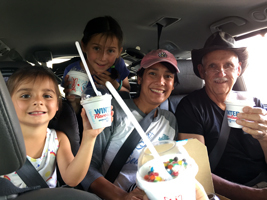 With our provisioning list in hand, we put Z and J in the car and drove 52 miles to the nearest Costco at Palm Beach, FL.. We had supper there to fortify ourselves for the “big shop”, then celebrated getting the shopping done with frozen yoghurt before we left to drive back to Ft. Pierce. Long day, but got a lot done! Lots of things going on...girls had school, then they went with Sarah to the story time at the library...Dave worked on doing some personal business that needs to get done before we leave...I prepared lunch, Dito was working on making colorful fish for our bow graphic. 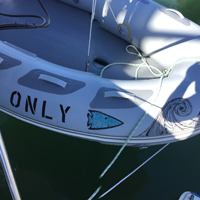 Most cruising boats have a distinctive graphic on the bow or bows (one hull or two hulls) of their boat. 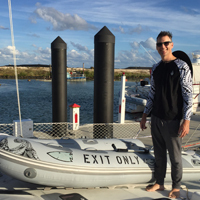 We will say something like, “We are on EXIT ONLY, the cat (catamaran) with the school of fish on the bows.” Most people have their graphic designed at a sign shop. We decided we wanted a fish that was based on an arrowhead shape, so Dito designed it. 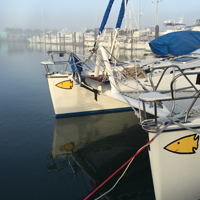 Right now there is one large yellow fish on the outside and inside of the bow of each hull. This is the design we had on the bows when we circumnavigated. 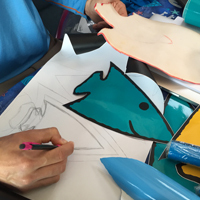 This time, the crew voted for more fish, so Dito has been making more fish that are different colors and sizes. 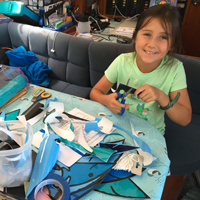 He uses special adhesive paper and the fish will be applied to make a design on the outside of our bows. I was holding the adhesive-backed paper flat (it tended to want to roll up) while Dito was cutting out the shapes. I will show the completed graphic after it goes on the hull. 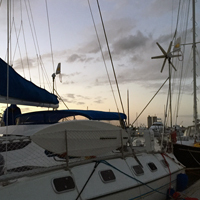 We had a reality check today...we came from the boatyard to the marina 19 December. We paid a reasonable fee to stay here for 1 month...until 19 January. Paying by the day is much more expensive. We need to be ready to move this boat by 19 January...maybe the 18th... (allowing a little leeway for weather). We can do it if we stay focused just a tad longer. The List is much shorter these days, but there is still enough to keep everyone busy. I got help from J with the laundry. 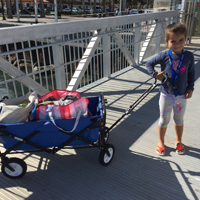 She pulled the wagon all the way from the boat to the marina building. 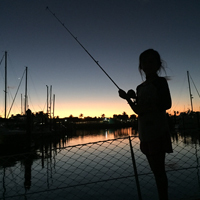 Added a picture Dito took of Z fishing off the boat last night. We are all waiting to see how it goes when she really catches her first fish! We are very aware of the days passing by. 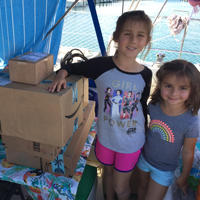 We all are ordering from Amazon...headlamps, school supplies, an inverter for the boat, a guide book to the Galapagos ...many varied things at sort of the “last minute”. 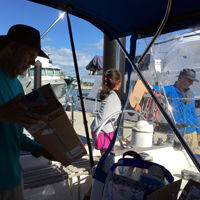 Once the packages arrive at the marina, we pack them up. Here is today’s collection packed into the blue wagon. 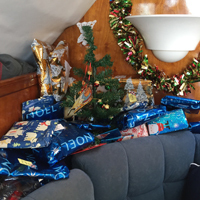 Upon arrival at the boat, packages are passed onto the boat, then stacked on the table. Now, the fun begins! Two of our crew are named “David Abbott”, so we have to open the packages to see who the order belongs to. Once the boxes are empty, we break them down and get all of cardboard off the boat. 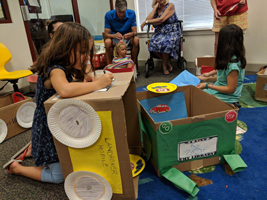 High humidity makes cardboard go “soft “ and cardboard can provide hiding places for bugs. Dito surprised everyone this morning by going to Dixie Donuts and having “breakfast” on the table when we got up. Look what he got for me! 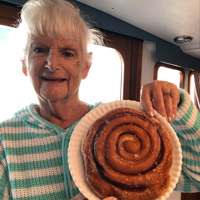 I love cinnamon rolls, but I never saw one this big! Deeelicious! I did share! Dito, Sarah, Z, and J went to Disney World today. It is about a two-hour drive from here. It was a day full of fun and surprises for the girls. I do not think they knew what to expect when they left. 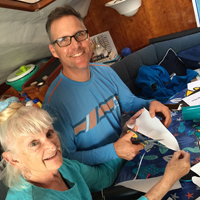 Back at the boat, Dave and I continued to work on the “jumble”. He worked on his personal stuff and the navigation station (desk). I was determined to get done sorting the jumble in the aft port cabin where my stuff is stored. 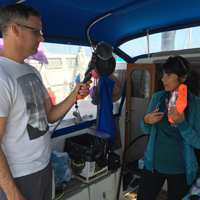 I was pulling out some things I do not want on the boat and boxing them up. The boxes will go in Dito;s car when it goes back to Kentucky. The domino effect kicked in. 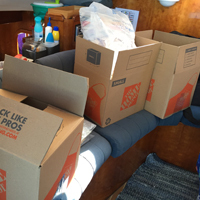 I took the office supplies out of the cabin, then had to put the items in the appropriate storage box in the starboard hull, then had to redo those boxes to fit it all in. I ended up reorganizing these smaller storage boxes because I was cleaning out the cabin! I repeated that scenario all day! 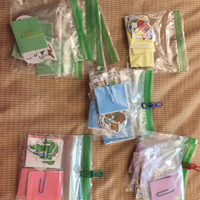 I am happy to report the sorting and packing is done! Dave and Dito tackled a job today that has been on The List since last year’s refit...removing copper tubing and wires that originally went to the freezer. 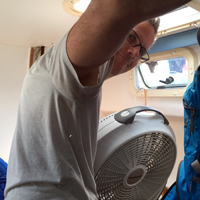 On our circumnavigation many years ago, we chose to use the freezer space for dry storage and not to run a freezer. 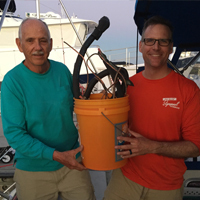 Dave knew the unused copper tubing was interwoven with the live wires of our present electrical system. He wanted the unused stuff removed. The pictures show the open control panel by the navigation table, Dito working under the floor boards in the starboard hull, and a bucket full of the copper tubes that were removed. Dave says our electrical system is safer now that the copper has been removed. Big job...done! We all left for Ft. Lauderdale around 0900 this morning. Takes 2+ hours to drive there. 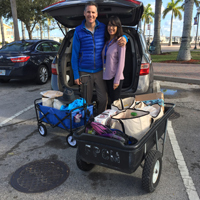 On the way, Dave called the water maker rep (in Ft. Lauderdale) to tell him we were ready to buy a water maker. The rep said a shipment was coming in next Wed. And he would ship one to us in Ft. Pierce next Thursday. One more job done. Meanwhile, while traveling south, I was in the back seat editing the blog posts I have written since 12 December 2018. You can see me at the restaurant table finishing editing while we wait for the lunch we ordered. Sarah will download my blog posts and put them onto my blog on maxingout.com. Lunch arrived! What was it? Pizza and salad. Six of us ate the whole thing! 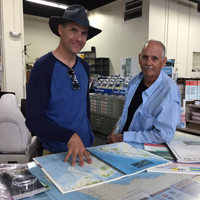 After lunch, we went to Bluewater Books to purchase electronic nautical charts (maps). We also have paper charts that we used on our circumnavigation. Looked at paper chart booklets, too, Shopped for emergency flares and an EPIRB (Emergency Position Indicating Radio Beacon). We always carry these items in our Go Bag (emergency bag that is always ready for us to grab it and go)...if the occasion arises. Thankfully, we have never needed to do use it. That is a good thing! More jobs were done today...more clean lockers, more stuff sorted, water tank filled (from the hose at the dock...potable water), Amazon orders arrived, shopping for boat parts, etc., etc., etc. School has been going well with both girls. Sarah works with Zoe, Grade 2. I work with Joss, Pre Kdg/Kdg. Both girls are doing well. 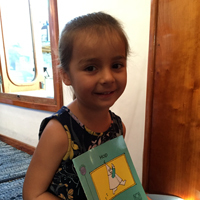 J has been learning sight words and completed her first of the Bob Books this week. She is so excited to be reading. She told us, “I can read now and you cannot stop me!” Believe me...nobody wants to stop her from reading! Another workday on EXIT ONLY! The List IS getting shorter. 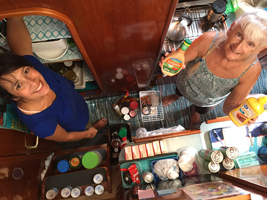 We are going through every shelf, bin, drawer, and locker on the boat. Everything comes out, is assessed, then decisions are made as to what things go back in and go with us...and what does not go. Dave shared his pic for the New Year so I could send it. He also was trying to convince Z and J that the winch covers were fashionable hats! I think they are humoring Baba! 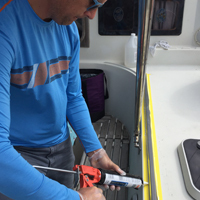 The other picture shows testing the hypalon patches that were put on the dinghy a week ago. The dinghy is hanging better on the davits, so they have decided the patches are a success! Happy New Year to everyone! My cousin and her son came to see us...and the boat...today. We had a nice lunch and visit with them! 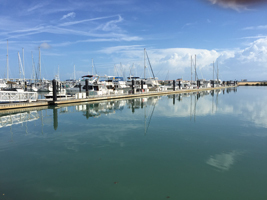 I mostly took family pics today, but I did find some pics to share...of the marina as well as documentation of a surprise visit from a manatee this morning, 01 Jan. I think that manatee started my year off right! Now, it is up to me to keep looking for those “surprises” around me everyday. Another day of warm, sunny weather today. Perfect for getting more jobs done. If you are wondering how Dito edits all those fun videos, well, here is a “behind the scene look” at his “team of consultants”. Everyone has ideas to share! Zoe and I are packaging the powdered milk into small bags. The amount of powdered milk is perfect for the containers of water we use to “make milk”. We use Long Life milk when we can find it, but carry powdered milk for our backup. We also use the powdered milk for making yoghurt and cooking. 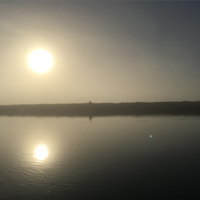 We woke up this morning to fog over the marina. The sun soon baked it off! 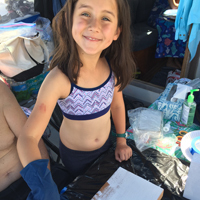 Dave and Zoe worked together painting the wooden holder that holds the windsurfer on the deck. I worked sorting out the jumble in the aft port cabin. When we go different places, we always like to try out local foods people recommend. 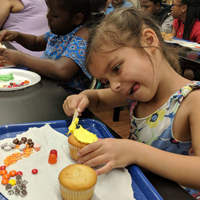 Two of our discoveries in Ft. Pierce include the kids decorating cupcakes at the library program for kids yesterday, and we discovered Dixie Donuts, made right here in town. Really good! Today was shopping day. Started with French pastries and fresh veggies from the Saturday Market in the plaza. 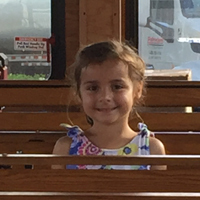 Next, the kids wanted to ride the town trolley. They heard it was free on Sat. So, we waited…and waited…and finally it came. Sarah, Z, J, and I boarded (we were the only passengers). Route on Sat is a two-block square through the parking areas for the Market. 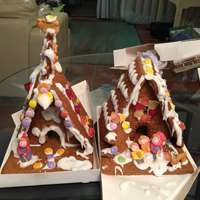 You can see from the pictures…the girls loved it. Because they did, I did! Back at the plaza , we got in our car and went to Dollar Tree (we buy our Long Life milk there by the case) and Walmart. 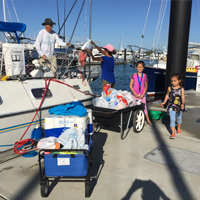 Back at the marina, we unloaded our purchases into one of the marina carts. 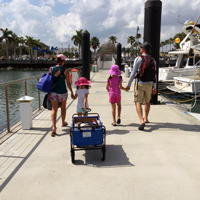 They provide the carts for us to use to carry things out to our boats at the dock. Today was laundry day, I volunteered to go. The coin laundry area is located at the marina in the main building. Dito and Sarah bought the blue fold-up wagon. We use it for everything! Fortunately, no one was using the washers and dryers, so laundry for six? No problem! The view from the laundry is very nice, isn’t it? Not bad to look at while doing such a routine job, There is a table under the windows and I was using it to recycle some of the schoolbooks J has finished. 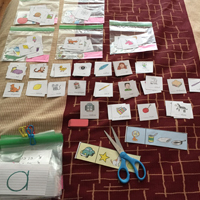 I will make flashcards for phonics practice…beginning sounds, ending sounds, etc. 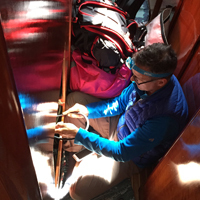 Meanwhile, everyone else was working on through-hulls (pvc tubes that go from something inside the hull to outside the hull), refinishing the wooden ends of the poles we use to hold our foresails out when we go downwind, and packaging more food for the boat (we remove all cardboard and put the food in closed containers or Ziplock bags). Always something to do! Another work day, ticking off the items on The List. 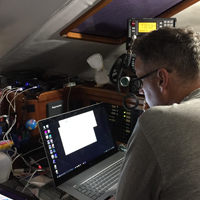 In the morning we did school while Dave and Dito spent more time trying to connect with someone on the ham radio…a little progress, but not enough. Electronics are great, but working on them can be frustrating. Dave and Dito are still working on the ham radio set up. Dito’s computer is having a problem, so the four of them took it to the “Apple Doctor” in Palm Beach this afternoon. While they were gone, Dave and I attacked the jumble in the salon and cockpit. Both areas need more attention, but we made significant progress. Not an exciting report, but good things are happening! 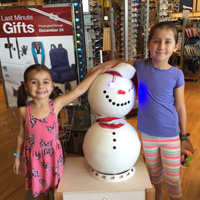 J and Z found another Florida “snowman” made of buoys at West Marine. 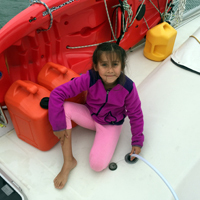 Z thought she saw another one in the balls of painter’s tape taken off after painting the bottom of the boat. Mmmmm? Today we had school first thing in the morning (trying to get some sort of routine going here…gotta start again sometime!). Went well, After the lunch Sarah prepared, I cleaned up the galley while Sarah took the kids shopping and to the park/beach. 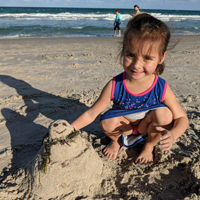 Look what J found at the beach…Florida style! 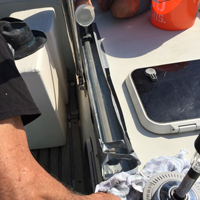 The other picture shows a close-up of the hypalon patch Dave and Dito put on the dinghy. 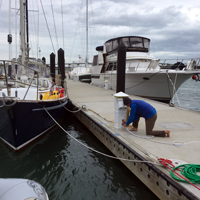 The placement of the patch will give better balance when we pull the dinghy up on the davits (arms going off the aft (back) ) of the boat to hold the dinghy out of the water. 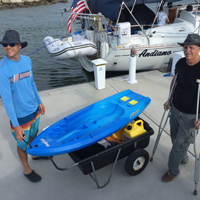 We pull our dinghy out of the water every night…no matter what, no matter where…we pull it out of the water. That makes it much more secure. The patch adhesive is supposed to be fully dry in one week. (!) (?) Will report the results next week. Merry Christmas to everyone from EXIT ONLY!! Here we are in front of EXIT ONLY in the sling before she splashed. Also, a pic of our miniature tree with miniature presents underneath! 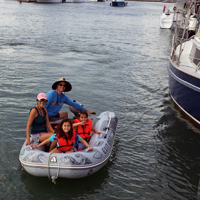 No problem ... Santa found our boat, The 2 miniature boat girls are happy, too! All of us are grateful to be here. Hope y’all are having a blessed happy day! 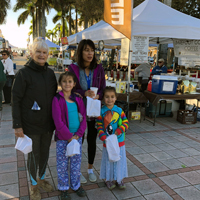 Remember the Sat Market in the plaza by the marina? 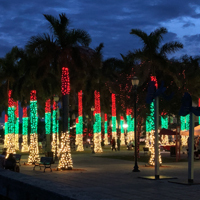 Well, every night from the end of Nov to early Jan there are lights on the plaza palm trees “dancing” or flashing while Christmas music plays for 3-4 hours in the evenings..People gather there every night to enjoy the music. We can hear the music from the boat! Very festive!! Back at EXIT ONLY, the big project was installing the new radios. 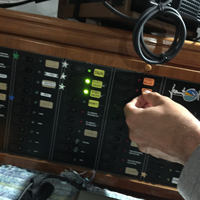 We depend on our SSB (single side band) radio for communication and weather information. Thought I would share some picture of some of our neighbors. 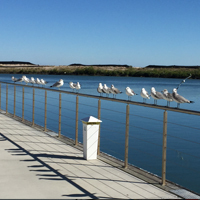 A line of sea gulls spends the whole day sitting there. If I do not meet their eyes, they do not even fly away when I walk by! If I look at them, they all fly away! Pelicans are kind of ungainly, but this pic makes this one look graceful. I think they have very powerful wings. 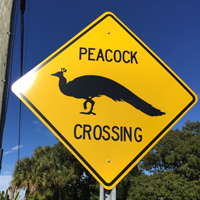 The street sign is common in one area of Ft. Pierce where a lot of peacocks live. We go down Orange Ave whenever we can just to look fo the peacocks. 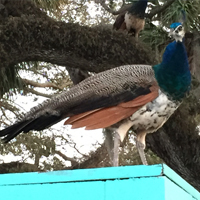 Locals tell us the peacocks and peahens have lived here for a long time. Sometimes, we have to stop and let them cross the street…like quail in Arizona ! 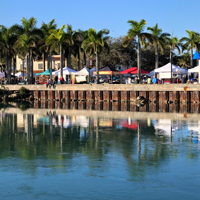 Every Saturday morning a market is held in the plaza area outside the locked gate to A dock. We look forward to going there early Saturday mornings. 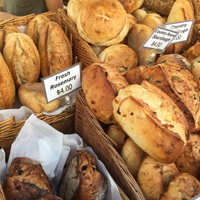 Those white bags in our hands might give you a clue as to which booth is our favorite…the French Bakery! 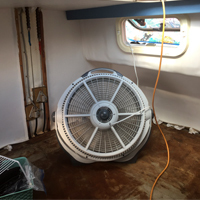 The boat work continues…the windmill is showing some improvement, the dinghy got pumped up, some electrical work in the port engine room was completed, we shopped for some needed parts before the stores close for Christmas, sent an order to Amazon, and more general cleaning and organizing. Time to make serious decisions…what stays...what goes. There is only so much room! 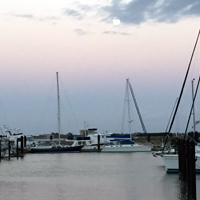 Looking out over the marina, there is EXIT ONLY in the middle of the picture…”out there” on A Dock with a moonrise in the sky. 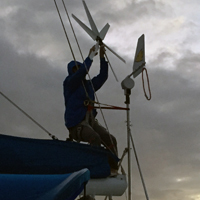 The guys have been working off and on with one of the wind generators that is not spinning properly. In one of the pictures, the generator hub and blades on the port (left) side aft (rear) are installed. The generator on the starboard (right) (aft) is not there in this picture. In the other picture, Dito is lifting the starboard hub and blades onto the starboard aft pole. These generators were refurbished last year. Since that time, one worked very well and the other not-so-much. Dave thought maybe an imbalance of the 6 blades inserted into the hubs caused the problem., so they took the blades to the post office (located in a Cuban restaurant) to weigh them on a digital scale. They were all very similar in weight. It was getting dark, so they willl finish tomorrow. We officially moved out of the condo today, so all our stuff is now on board…a bit of a jumble right now! The weather made moving things challenging…sun, pouring rain, cold north wind, cold us…repeat...all day long! Sea trials for the engines took place at the dock today. The winds were in the high 20’s, gusting into the 30’s. It rained hard off and on all day. 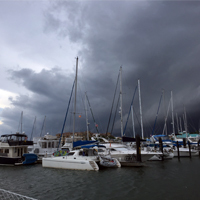 The pics show the dramatic storm clouds over the marina. The man who installed the engines came to install some gauges. He ran each engine through its paces right at the dock. He said everything was fine! 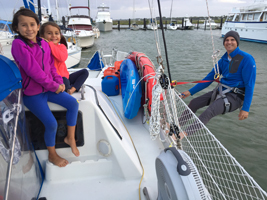 I think everyone was happy not to go out into 30 knots per hour winds in the pouring rain. Not a nice day to be “out there”. The “Splash” went very well today! The lift smoothy carried EXIT ONLY in a sling from the dry boatyard to the water. Once the boat was poised above the water, they lowered the sling, unhooked it, and the boat was held in place by ropes. Five members of the crew got on board the boat and started the engines, began lifting the fenders up and onto the deck and pulling the ropes on board. I kept taking pictures from shore while the boat backed out into the main channel. 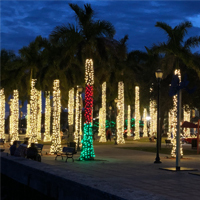 My job was to drive the car from the boatyard to the Ft. Pierce City Marina in downtown Ft. Pierce (a distanced of maybe four miles). You can see the picture I took of EXIT ONLY as she approached the dock at City Marina. We all were SO happy and relieved to be back in the water! Weeks ago the marina said we could stay at the dock 2 days (“Busy season”, they said). Four days ago they said we could stay 3 days. (We will take it!). Today, when Dave went to the office to pay, they said we could stay one month! (Really??? Thank You!!!). We will have time to finish a short list of things we have left to do. Nice having the pressure off. Tomorrow is Sea Trial Day. 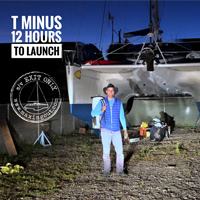 This is a short trip out from shore to check out the new engines with the man who installed them. 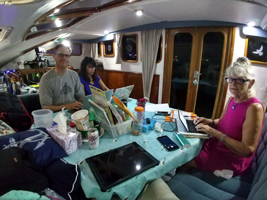 We are staying in the condo until Friday morning because while Dave and Dito go offshore on sea trials, the rest of the crew will stay on shore. The painting is done! We got 3 coats from 5 cans of paint. Sarah took Dito’s picture in front of the boat when she picked them up (hopefully the boat’s last night in the boatyard). I was back at the condo preparing supper. 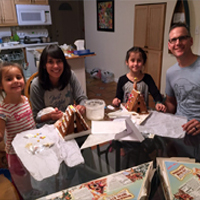 Back at the condo, after supper it was time to get out the gingerbread house kits. 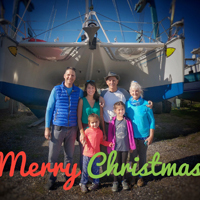 In the middle of all the boat “stuff”, we are not going to miss out on a Christmas! There are two junior members of the crew who are counting on us to make it happen. 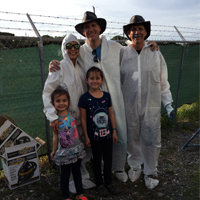 Sunny day…no rain…perfect day for painting! 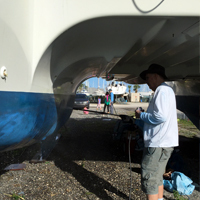 Dave used the water blaster to clean off the dust from the hull. Next, the whole area was gone over by hand to make sure the surface is clean and smooth. Finally…it is time to roll on the new bottom paint. Looks like there will be enough paint for 3 coats of paint. Each layer has to dry four hours before the next one can be applied. The third coat will go on tomorrow. Two days until “splash day”! The sanding was easily finished this morning. The next step of prepping the hull for painting was pressure washing the bottom to remove all of the hard-to-see blue dust generated by the sander. You can see Z and J got in on that water action (it was 80 degrees here!). Now, you can see the NEW paint..This paint is supposed to be more effective because it has 60% copper in it. The old paint had 40% copper in it. Splash Day is coming…3 more days! P.S. 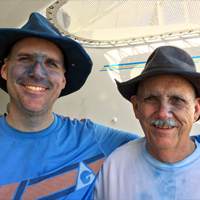 Yes, Dave’s mustache is blue from using the sander! 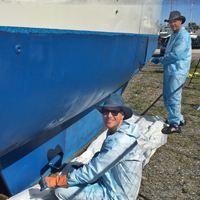 Today they finished scraping the places where barnacles had attached to the hull. 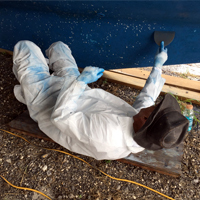 There is Dave on the ground scraping the bottom of the keel. 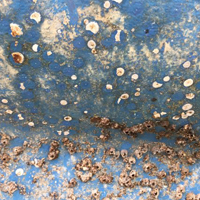 The close-up of the barnacles shows exactly what they have been removing. 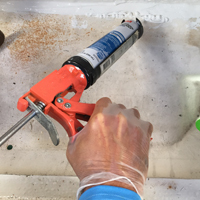 Once the barnacles are removed, the old bottom paint has to be sanded to remove the small remaining pieces of the barnacles and to smooth the whole surface. Two hulls = 4 sides, each 39’ long = 156’ of surface to be scraped and sanded. 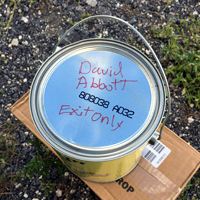 Maybe tomorrow I can show you pictures of the new replacement paint the paint company rep left at the marina office with “For Abbott/Exit Only” written on it. Dave and I made it to Florida! 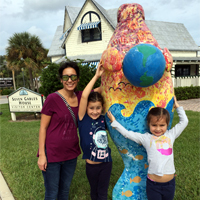 Two pictures show Sarah, Z, and J at the Manatee Center near the library (and the marina we will take the boat to) in downtown Ft. Pierce. 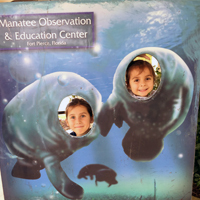 We saw several live manatees, too! We went there while Dave and Dito went to Home Depot to get supplies to redo the bottom paint after the barnacles are removed. The other picture shows the work crew poised to eradicate those pesky barnacles! My job was to take the girls to the park playground. All hands on deck! Four work days left before the boat goes in the water on the 19th. You know how life can throw you a curve ball? Well, we caught quite a curveball last summer. 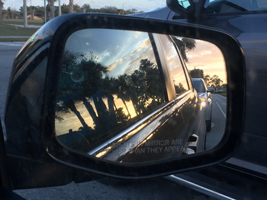 On 20 June 2018, Dave and I left to drive our two vehicles back home from Florida. 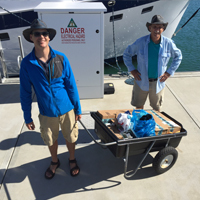 The majority of boat preparation was done and we were getting close to our departure date. We arrived safely 4-1/2 days later. We already had plane tickets to return to the boat 05 July 2018. We were looking forward to 10 days at home...reconnecting with friends, taking care of some business, etc. It was a busy, fun time that passed all too quickly. We woke up early on 05 July...and Dave was too sick to go to the airport. We went to the hospital ER instead! Long story short, Dave was admitted to the hospital for the first of three times in the next few weeks. He had the first of four procedures done that day! His gall bladder had shut down. Very long story short, Dave had four procedures before he was on the way back to good health. 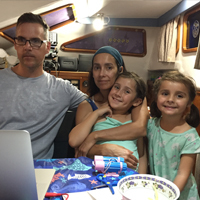 Dito, Sarah, Zoe, and Joss returned home while the doctors were figuring out how to deal with Dave's health problems. 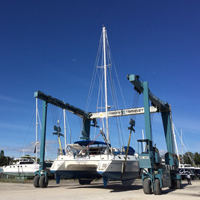 When we all realized this unexpected pause was going to take awhile, Dito returned to Florida and, with a friend's help, moved EXIT ONLY from the slip at the marina dock back to the boatyard into storage...again. We have all made the most of the last 5 months and 3 weeks! 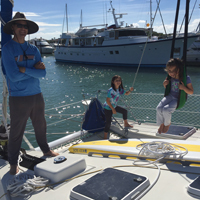 Dito, Sarah, and the girls drove down to Florida and arrived at the boat today (12 Dec). 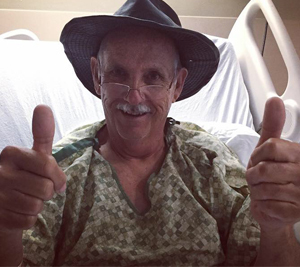 We are all grateful Dave is healthy and strong again! He and I are flying to Florida tomorrow (13 Dec). The crew of EXIT ONLY is ready to go! We are truly grateful to have the possibility of sailing together again. 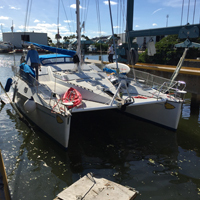 The boat was almost ready to leave Florida back in July, so we do not have a lot of jobs on The List to do now. We immediately have to redo the bottom paint job. 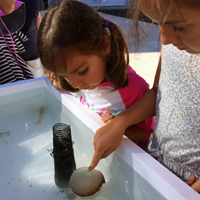 When they lifted the boat out of the water in July, Dito and everyone else could not believe how many barnacles were covering the bottom! 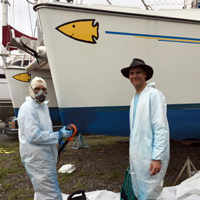 We contacted West Marine and they contacted the manufacturer, Petit Paint. 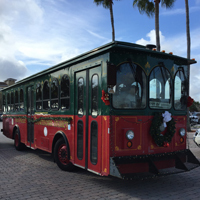 Another long story short, the Petit Paint representative for Florida has been in touch with us and they are going to replace our paint and upgrade it! We are very grateful for their attention and their willingness to help us with our problem. Since our "splash day”is 19 December, we will hit the ground running...or should I say, they will hit the boatyard ready to do scraping, sanding, washing, and painting as soon as we can start on Friday, the 14th!